I’ll be going on a short term missions trip to Arizona this summer for a week! It’ll be through a ministry called P2 Missions from the North American Mission Board. Our church will be partnering with a church plant there and hosting a basketball and bible lessons camp to outreach to the kids in the community. I’ve been to P2 Missions (formerly called PowerPlant) twice as a high schooler, but this time I’ll be going as a counselor! It’s a little weird, partially because I feel like a baby compared to all the other counselors (I’m the youngest! ), but I’m pretty excited to see what God has in store for me and the team. It’ll be fun getting to know the other students on the trip, and it’ll definitely be a new experience for me! It’s been two years since I’ve been at PowerPlant, and both trips I’ve gone to have been a huge blessing and learning experience. God is good! Like my pastor mentioned to us (Hi Mat! ), on missions trip we can get so consumed with the “doing” that we forget another crucial aspect of the trip: prayer. We’re so busy preparing ourselves with things we have to do that we forget to pray. We need to pray not only because we are called to, but also because by praying, we are entrusting the fruits of the missions trip to God, understanding that under all circumstances, God is in control and is sovereign. So with that said, please pray for us! The reason why I mention this is because I wanted to make something for the students at our Friday night meetings. I wanted something that could make enough for a group of 25, and something that wouldn’t take up too many resources. 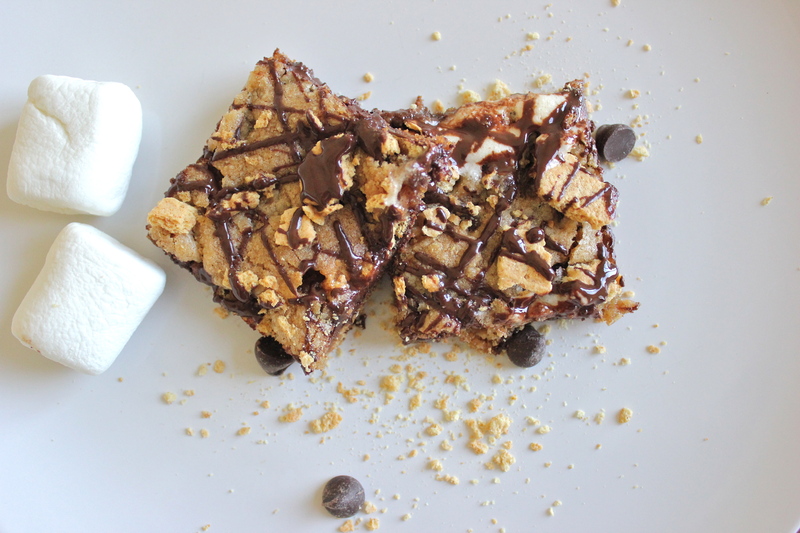 My apartment has a bunch of graham crackers and marshmallows leftover from a beach trip, so I typed in smores bar into foodgawker and came across these. And I am SOOO glad I did. My favorite part of a s’more is the toasty marshmallow. 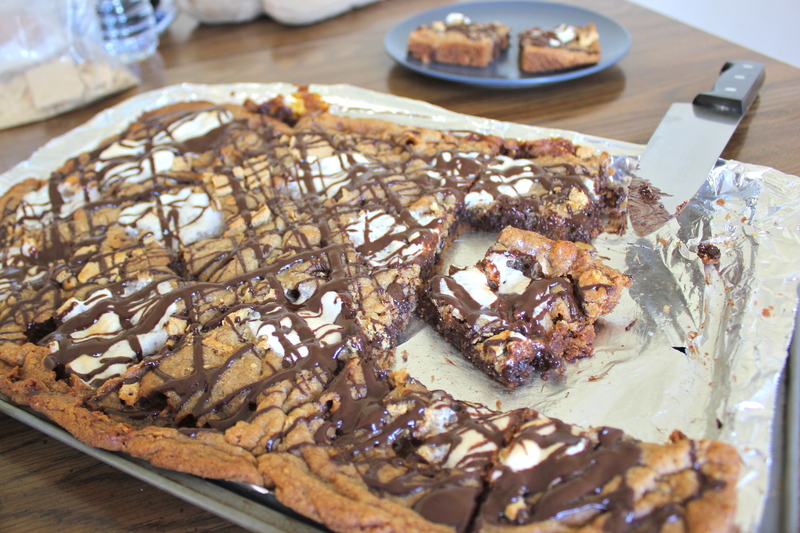 This cookie bar has toasted marshmallows baked right into it, and it’s soo good. 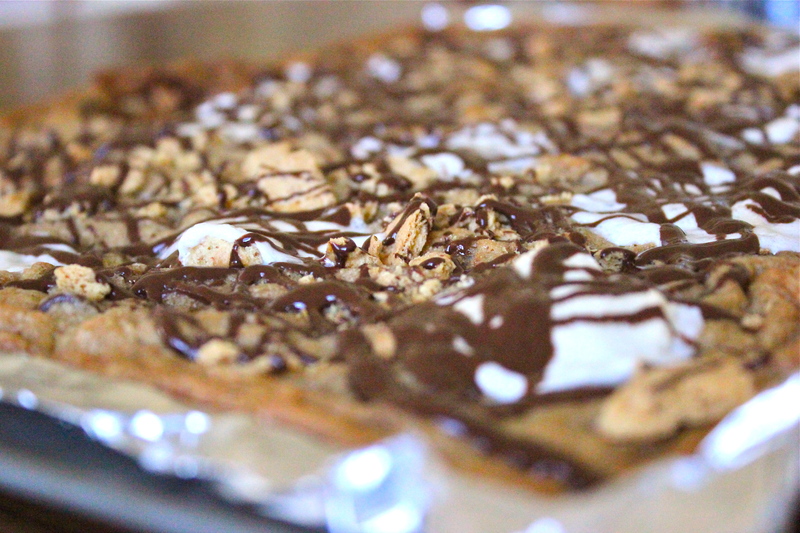 It comes together rather quickly, and it’s packed with chocolate, marshmallows, graham crackers, and more marshmallows. 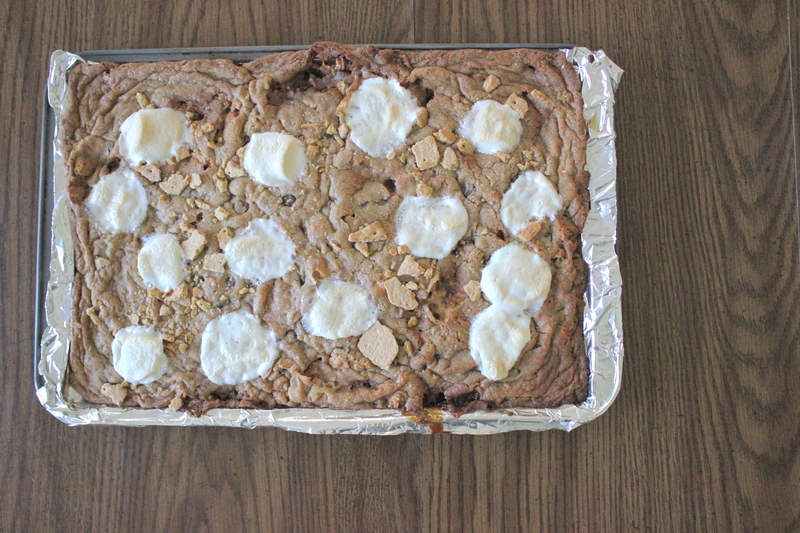 The cookie dough base was soft and chewy, and the toasted marshmallows in the dough were the cherry on top. Genius, I say! This is definitely a keeper. 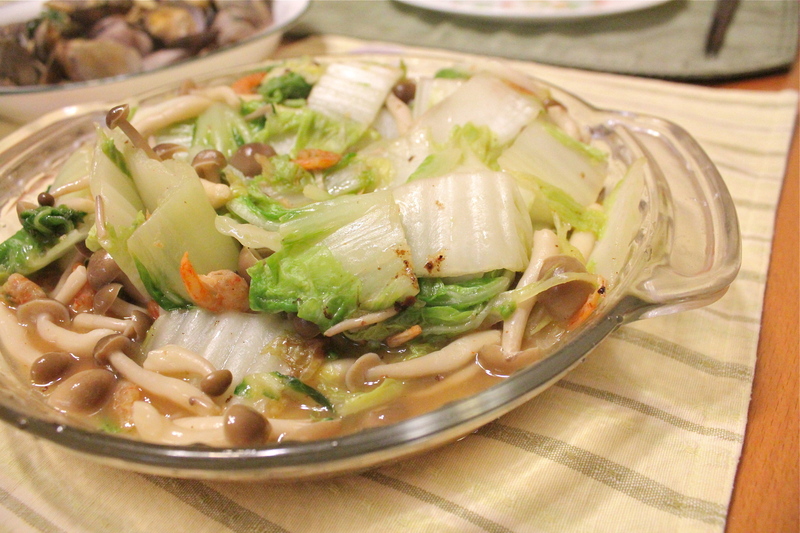 I really don’t repeat recipes often, but this one will definitely be repeated in the future. 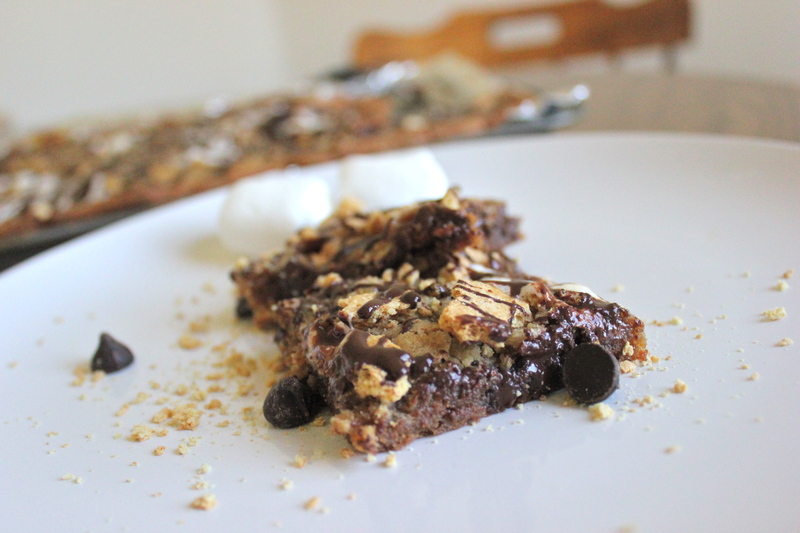 Chocolate chip cookies and s’mores in a bar–what’s not to like?! Preheat the oven to 350˚F. 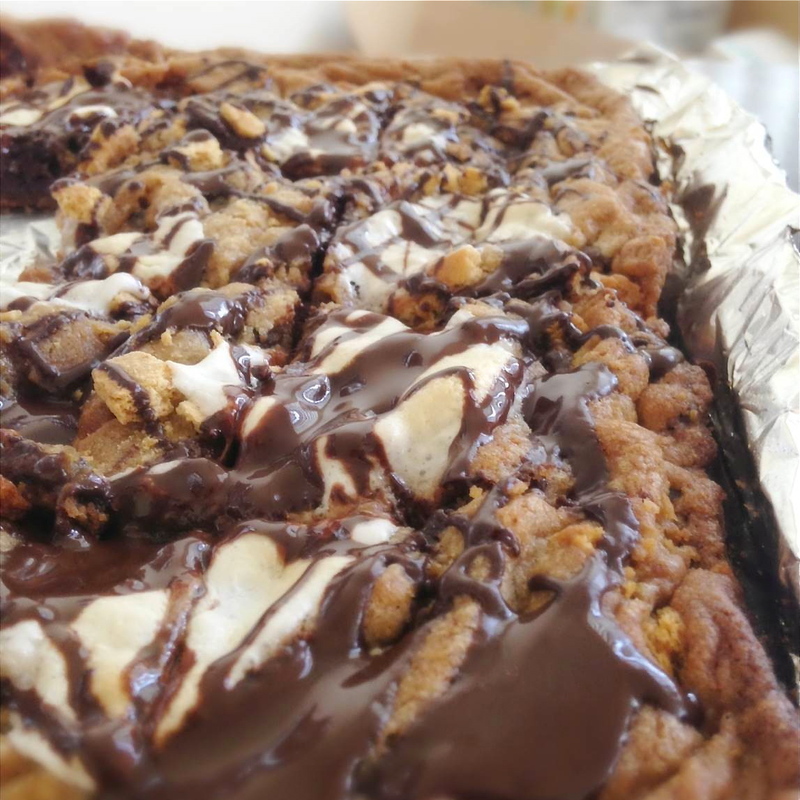 Line a large cookie sheet with parchment paper (for toasting the marshmallows), and line a 9×13 cookie/jelly roll pan with aluminum foil and spray with nonstick spray. 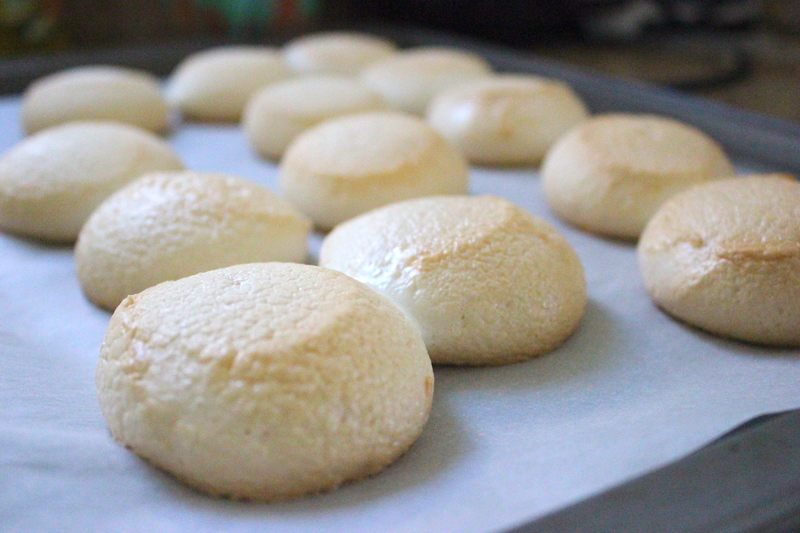 Place 10 of the 15 marshmallows on the parchment paper lined cookie sheet and place in the oven. 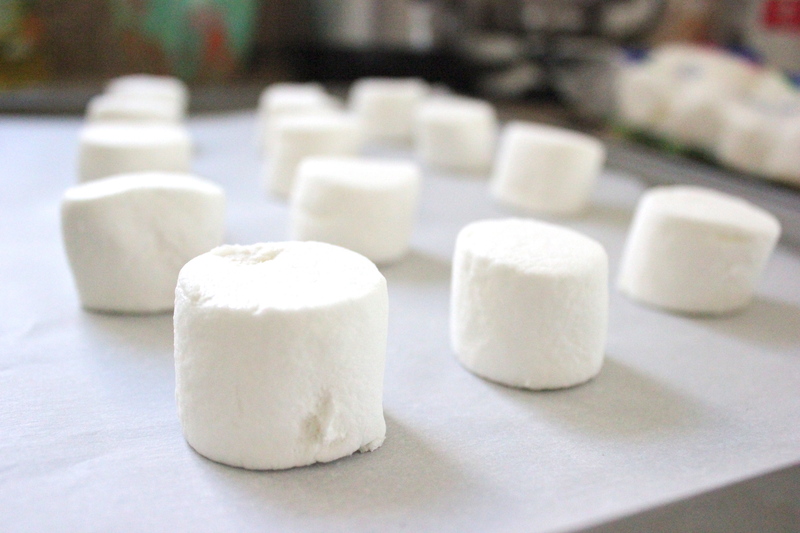 Bake for about 10 minutes, until the marshmallows start to puff up and get golden brown. I really like marshmallows so I saved about 12 for the dough and one or two for myself =). Be careful when the marshmallows are in the oven–they might burn on the bottom. Meanwhile, cream together the butter and sugars until light and fluffy. Add egg and vanilla; mix well. In another bowl, combine the flour and baking soda; slowly add to the butter mixture. Mix to combine. In a ziploc bag, break the graham crackers into small chunks (not crumbs). When the marshmallows are toasted, scrape them into the dough and mix to combine (I found it easier to peel off when the marshmallows cooled for a minute or so). 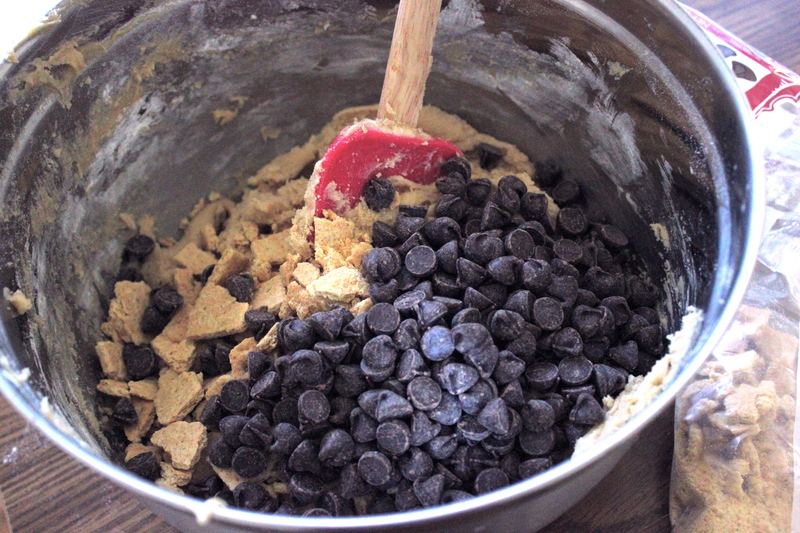 Add the chocolate chips, minus the 1/4 cup reserved, and the graham crackers. 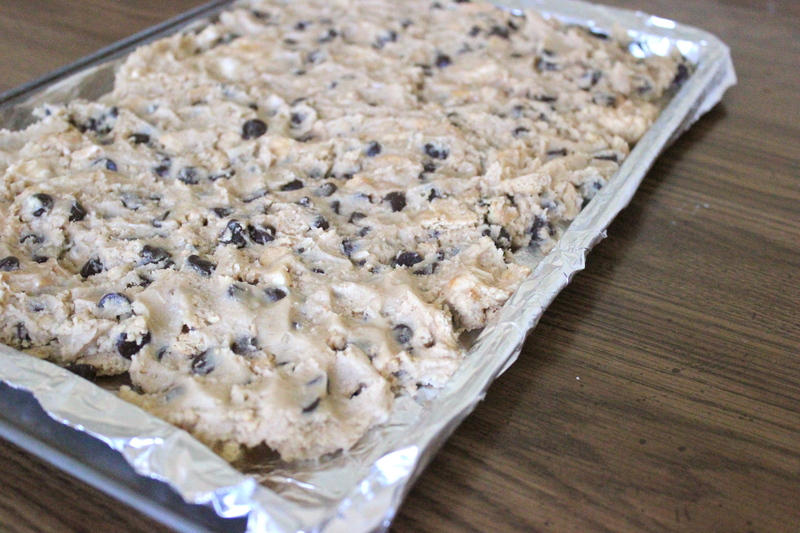 Press the dough into the sprayed foil pan, and press down to evenly spread out in the pan. I found it easier to press the dough into the pan with wet fingers. Sprinkle the remaining graham cracker pieces (I forgot this until toward the end). Bake for about 15-20 minutes. Add the remaining marshmallows on top of the batter, and bake for another 5-10 minutes until golden brown and the marshmallows toasted. Let cool on counter. Meanwhile, melt the remaining 1/4 cup chocolate with the oil in 30 second intervals (stirring after each interval) until melted. 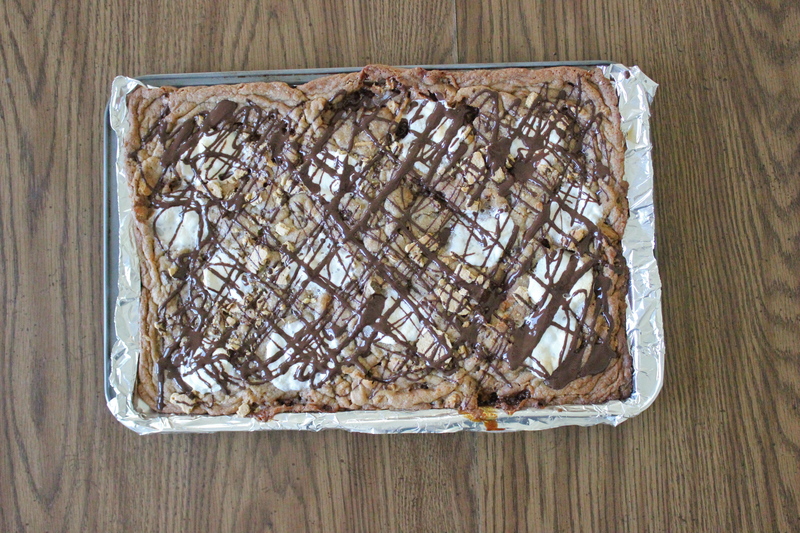 Drizzle over the top of the cookie bars. Let is set, then cut into bars and enjoy! After! Just kidding. Not done until the chocolate’s on top. Soli Deo Gloria, and Happy reading, eating, and baking! I’m picky. I don’t like spicy food (I’m getting there though! 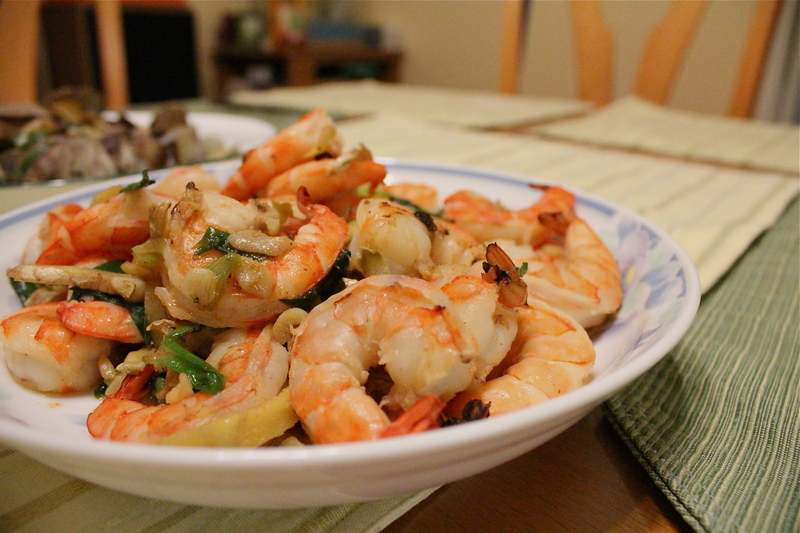 ), whole tomatoes, peppers, onions, green onions, sashimi, mustard, ranch dressing, and the list continues. And on that list is nuts (not to mention that people call me nuts because my list is so nuts. HAHA okay, done). I don’t mind nut flavors or ground up nuts (like in macarons), but the only nuts I will eat whole are peanuts. No pecans, walnuts, cashews, pistachios, or almonds–not sliced, chopped, or whole; not in brownies, cakes, or toppings. 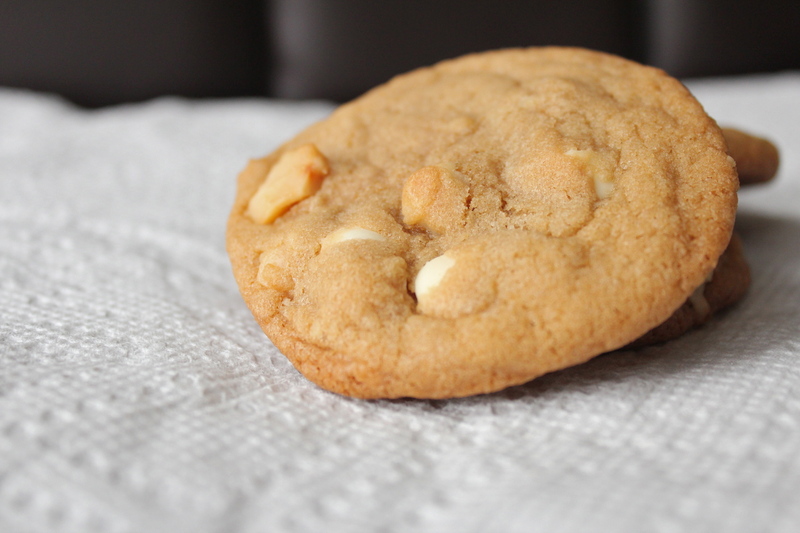 When it comes to macadamia nuts and cookies, I suppose those can be an exception, only because they’re J’s favorite cookies. J did all the work (and please excuse the phone camera quality on some of the photos! )–he chopped the nuts, creamed the sugars and butter, and mixed everything together. I just measured and took pictures. Quite important, if you ask me =)! Mix together the flour and baking soda in a bowl; set aside. In another bowl, beat the butter and sugars until creamy. Add the egg, yolk, and vanilla; mix well. Gradually add in the flour mixture and stir until a dough forms. 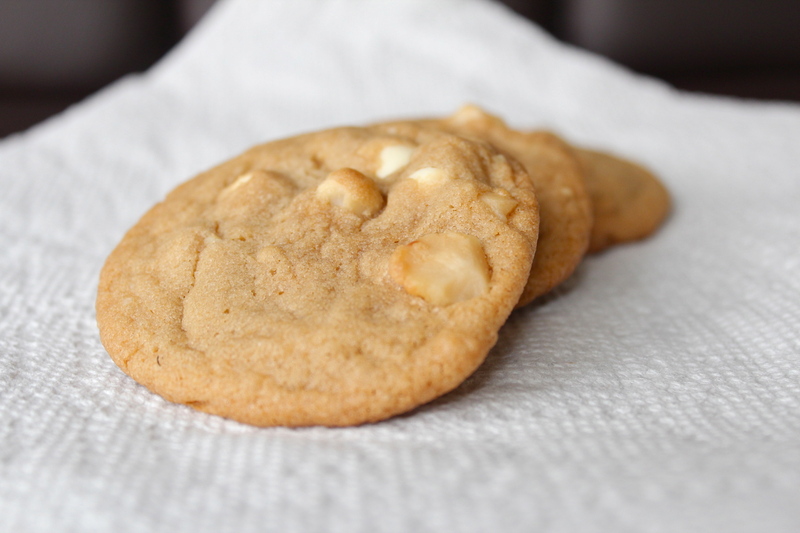 Fold in the white chocolate chips and macadamia nuts, being careful not to overmix. 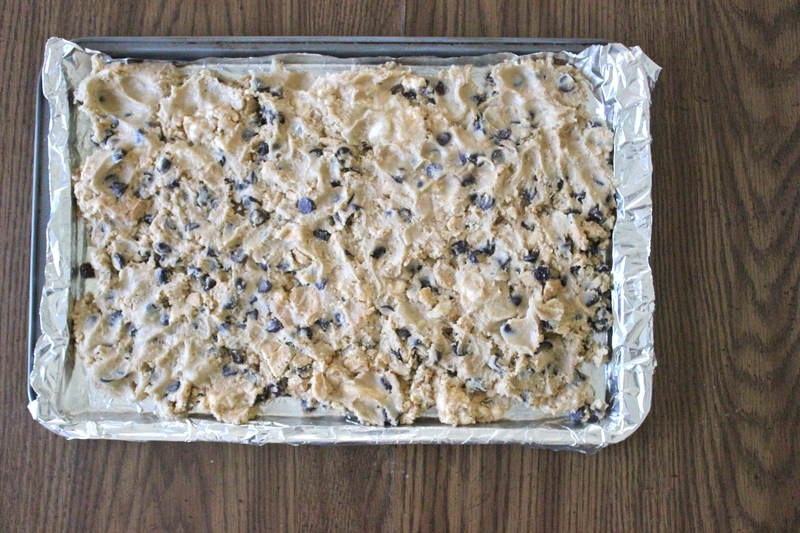 Chill the dough for at least 30 minutes in the fridge (this helps create a thick and chewy cookie). Drop tablespoon-sized balls onto a baking sheet. 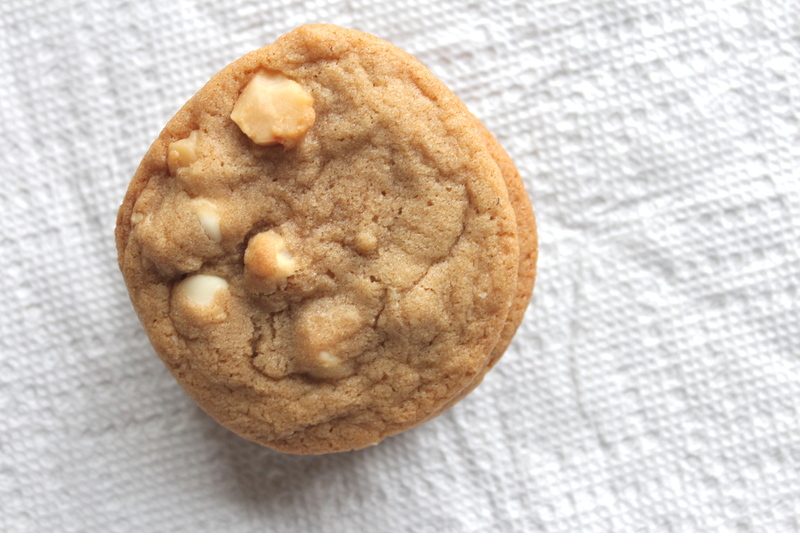 Press a few more white chocolate chips and macadamia nut pieces onto the tops for decoration (I forgot to do this step!). Bake for 8-10 minutes or until edges are lightly browned; the centers should appear very soft and puffy. Transfer to wire racks and cool completely. Enjoy! That’s my momma–wise, kind, a woman of God, compassionate, caring, and giving. She’s always willing to serve our family and others, and she never complains. She’s always thankful for what she has and constantly teaches me to pray and trust in God in all circumstances. She is strong in her faith, always ready to faithfully serve God and pursue Him. My mom is definitely an encouragement and a blessing, and I am definitely who I am today because of her. I love her! And I would totally post a picture, but she doesn’t like it when I post pictures of her online, so I think I’ll pass this time =). I know I’m a coupla weeks late, but HAPPY (belated) MOTHER’S DAY! 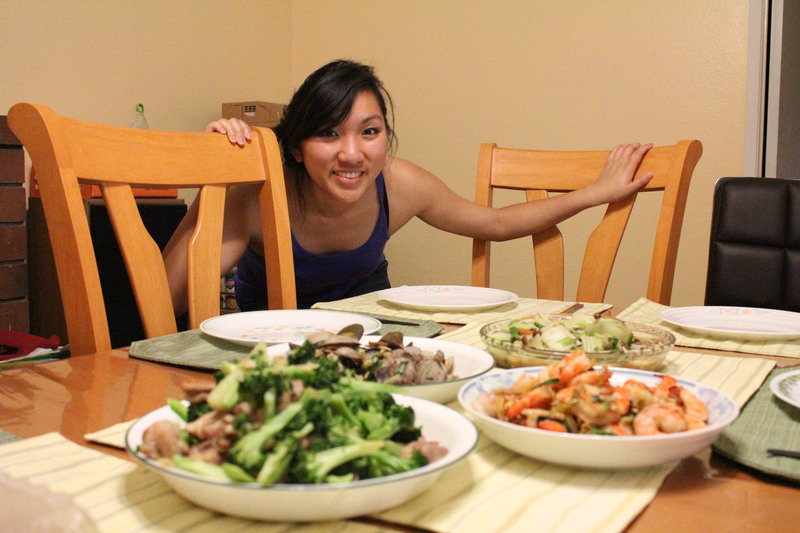 Normally our family goes out to some Chinese restaurant to celebrate, but this year we did something different–we cooked. And by we, I mean me, my sister, and my 8-year old cousin. 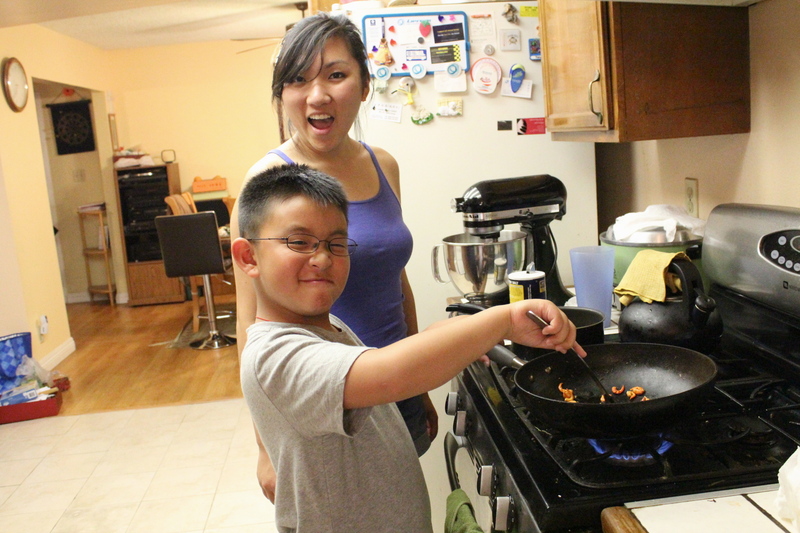 I think this is the first time we’ve ever cooked for our parents together, and it was a joy! Who knew my sister would be quite the chef? And Darren was so excited; he kept asking if he could help cook/take pictures/set up the plates. 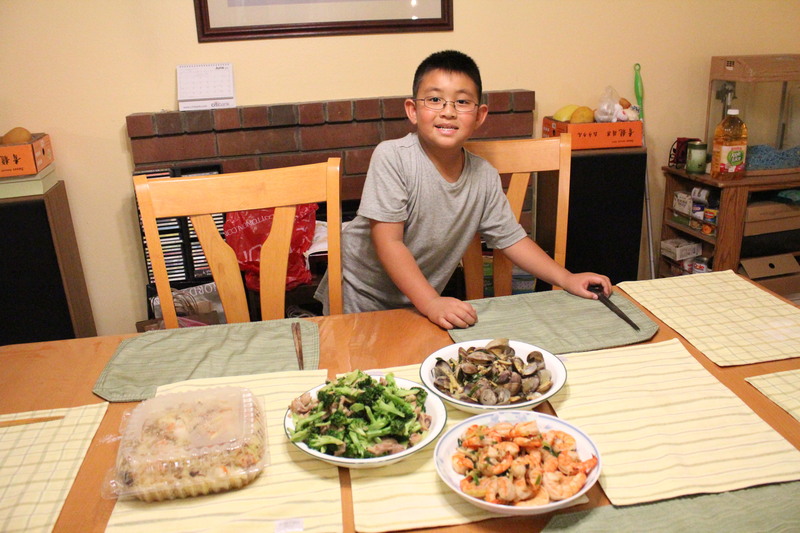 We had five dishes on the menu–broccoli and chicken, shrimp, clams, baked fish filets, and napa cabbage with mushrooms. 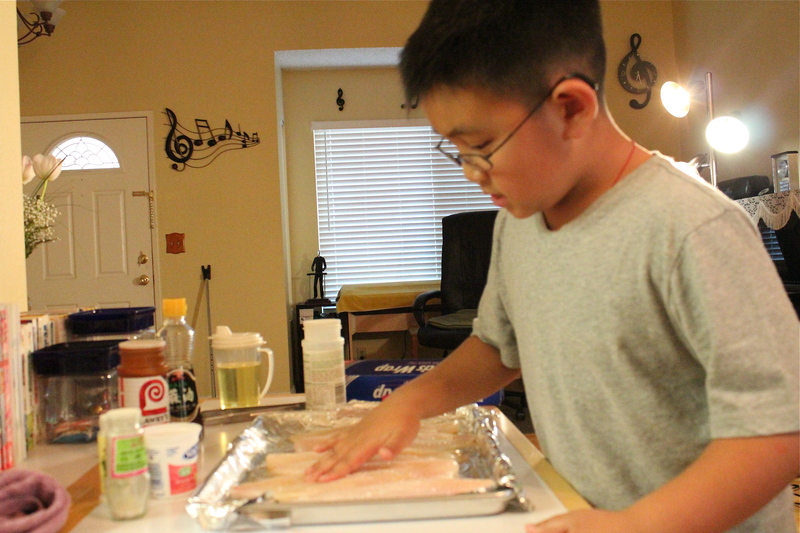 Darren helped my sister with the napa, and he helped me with the fish fillets. 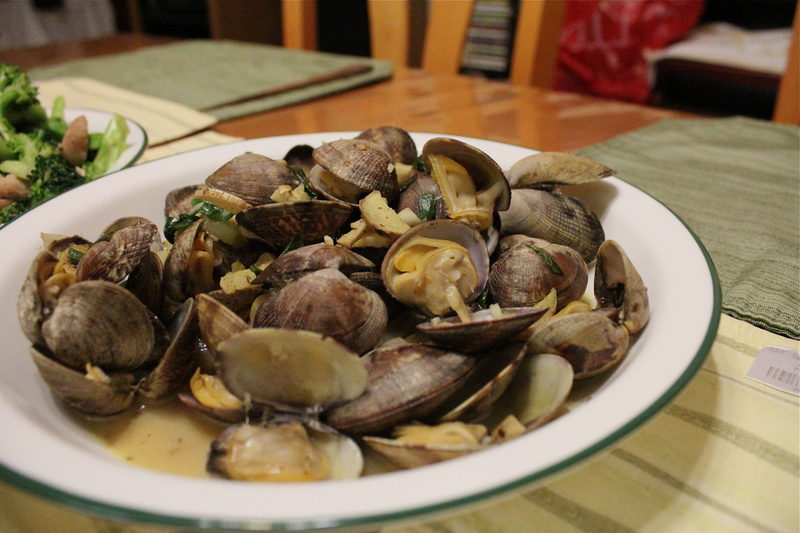 The fish look slimy, but they taste great, I promise! 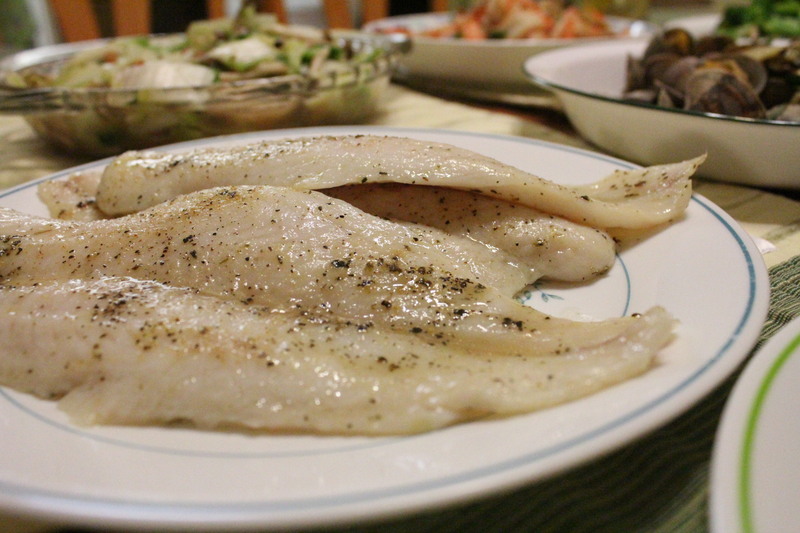 It was funny–I asked him to rub the seasonings onto the fish, and he would literally rub the seasonings on the fish pretty much 30 seconds per side of the fillets. I told him he could go faster (meaning not working on one fillet for so long), but instead he just rubbed the fillets vigorously as if he was scrubbing something off. Hopefully that made sense; it was funnier when it happened =). 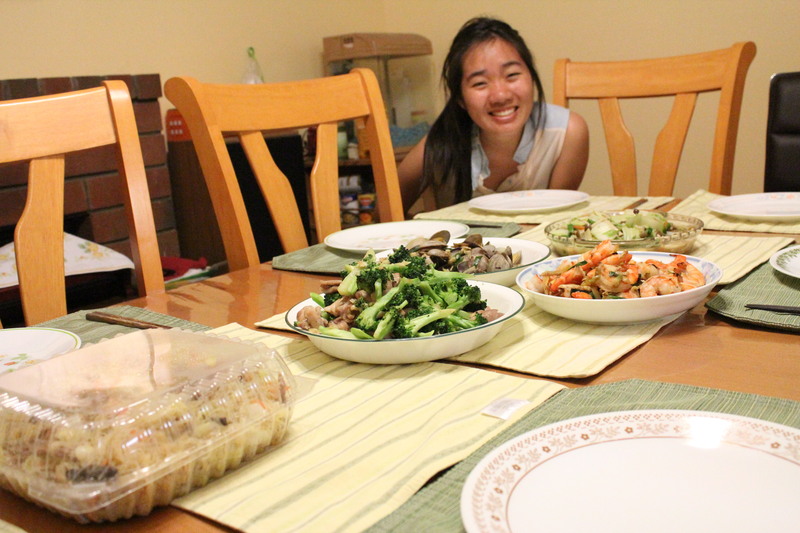 All in all, the dinner was a success! We were all full from the tasty dishes, but don’t worry, there’s always room for dessert. 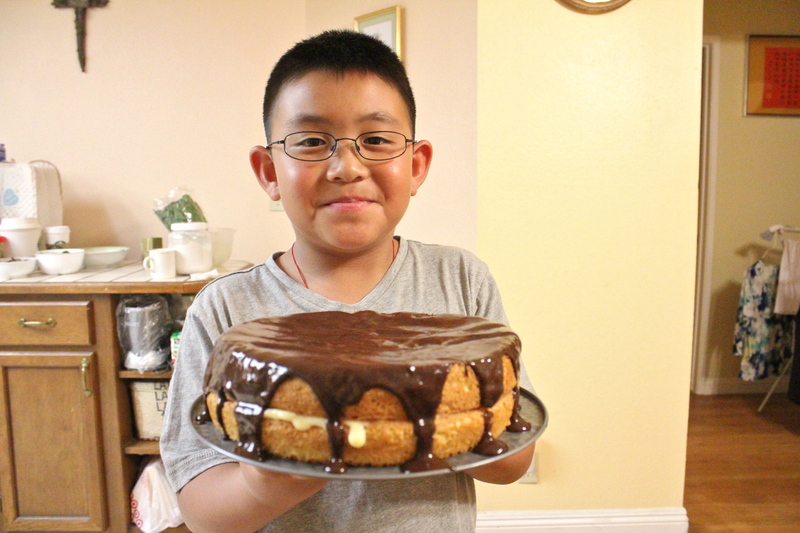 My mom told me about this bakery that makes really good Boston Cream Pie, and she wanted me to make it. What better day to make it than Mother’s Day, right?! 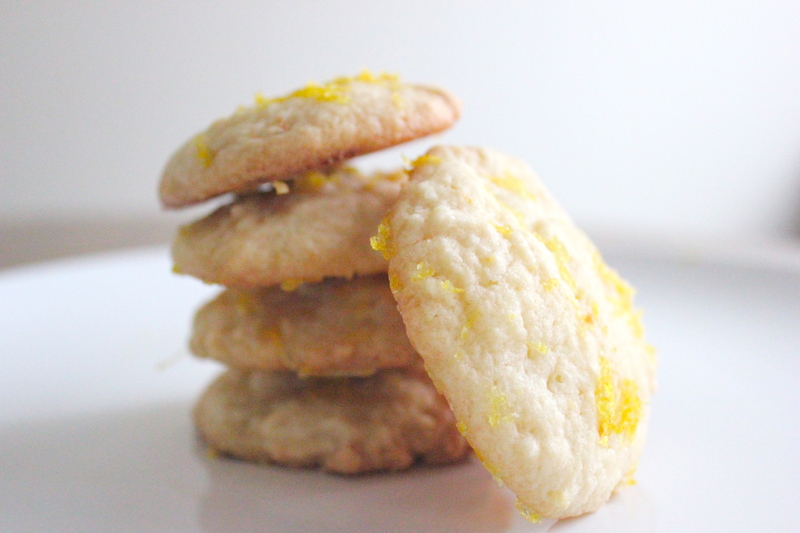 I searched all week for a recipe, and I finally settled one from Joy of Baking. I’ve made a few things from her site before, so I wasn’t worried about it coming out as a complete flop. 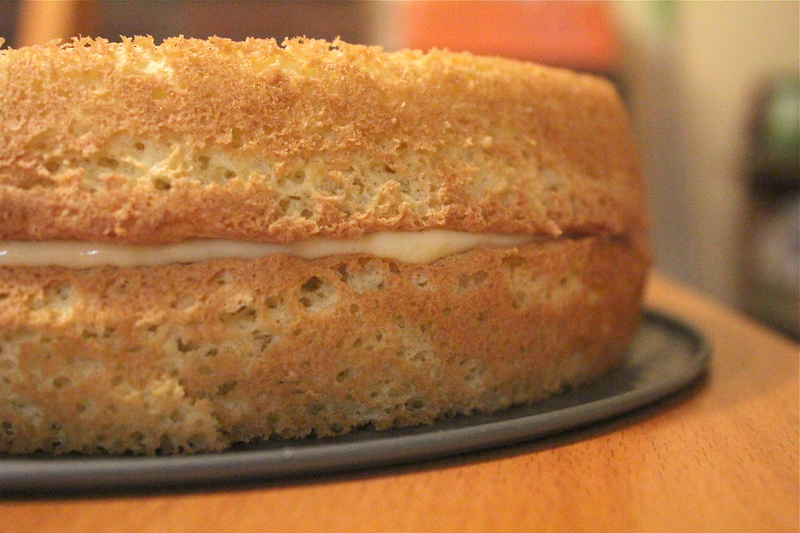 For me, considering how I’m used to Asian style chiffon cakes and whatnot, the sponge cake was a little dry for my taste, but once it sat in the fridge with the pastry cream overnight, it was more moist and tasted even better. I used the same pastry cream as the one from the fruit tart, and it’s really easy to make; just make sure you don’t scramble the egg yolks! The cake was good, and I hope my mom and aunt liked it =). 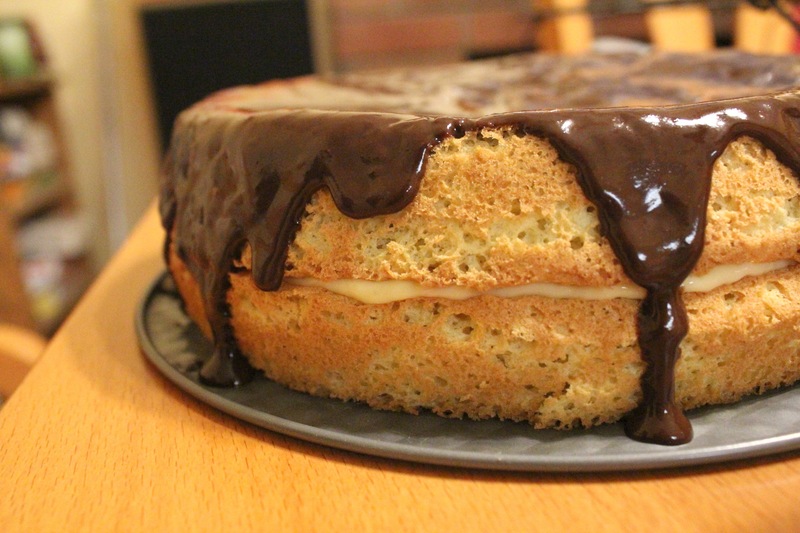 There’s a lot of chocolate ganache, so be prepared! In a medium heatproof bowl, mix together the sugar and egg yolks. 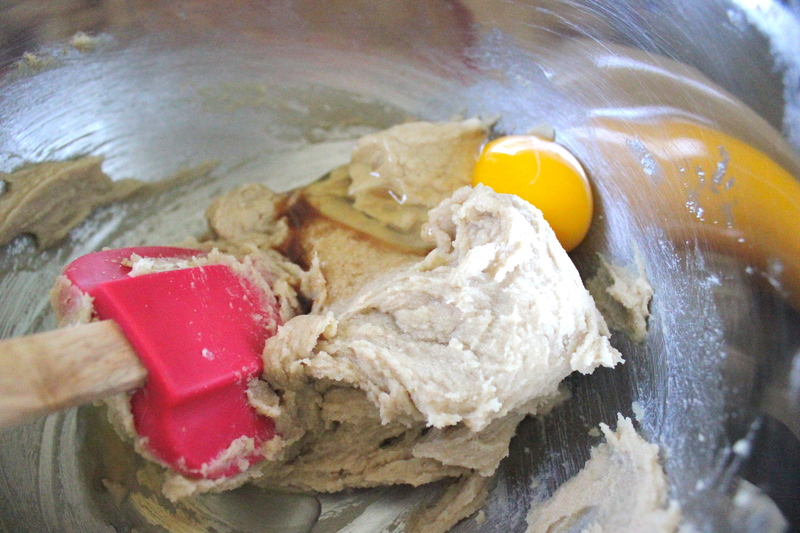 Sift the flour and cornstarch into the egg mixture and mix until you get a smooth paste. In a small saucepan, bring the milk just to a boil over medium heat. Whisk the milk slowly into the egg mixture; whisk constantly to prevent curdling; strain if necessary. Place the egg mixture back into the saucepan and cook over medium heat until it boils, whisking constantly. When it boils, continue to whisk constantly for about a minute until it becomes thick. Remove from heat; whisk in the vanilla extract. Pour it into a bowl and immediately cover the surface with plastic wrap to prevent a crust from forming. Let the pastry cream cool in the fridge for a few hours before using. Preheat the oven to 350˚F. Butter and line the bottoms of two 8-inch round cake pans with parchment paper. When the eggs are still cold, separate three of the eggs; add the two remaining eggs to the yolks. Cover both bowls with plastic wrap; allow to come to room temperature. In a bowl, whisk together the flours, baking powder, and salt. Place the milk and butter in a small saucepan and warm until the buter melts (I used the microwave instead). In a large bowl, beat the whole eggs and yolks and 1/2 cup sugar until they are thick and fluffy (the batter should fall back into the bowl in a slow ribbon). Beat in the vanilla extract. In another bowl, beat the egg whites until foamy. Gradually add the remaining sugar and beat until soft, moist peaks form. Fold some of the whites into the other batter, then add the rest of the whites and fold just until incorporated. Sift half of the flour mixture over the top of the folded batter, and gently fold through with a rubber spatula. Sift the rest of the flour and fold in. Make a well in the center of the batter; pour in the butter and milk mixture into the bowl and gently fold in. Divide the batter evenly between the two pans and bake for about 18-20 minutes or until light brown and springy to the touch, and a toothpick inserted in the middle comes out clean. Invert the cakes onto a wire rack; remove parchment paper and re-invert. Let it cool completely. Place the chocolate in a small heatproof bowl. Bring the cream and butter to a boil in a saucepan over medium heat. Pour the cream over the chocolate, and let sit for about 2 minutes. Gently stir the cream and chocolate together until the chocolate has melted, and set aside until it is thick enough to pour. Place one cake layer on the serving plate; bottom side up. 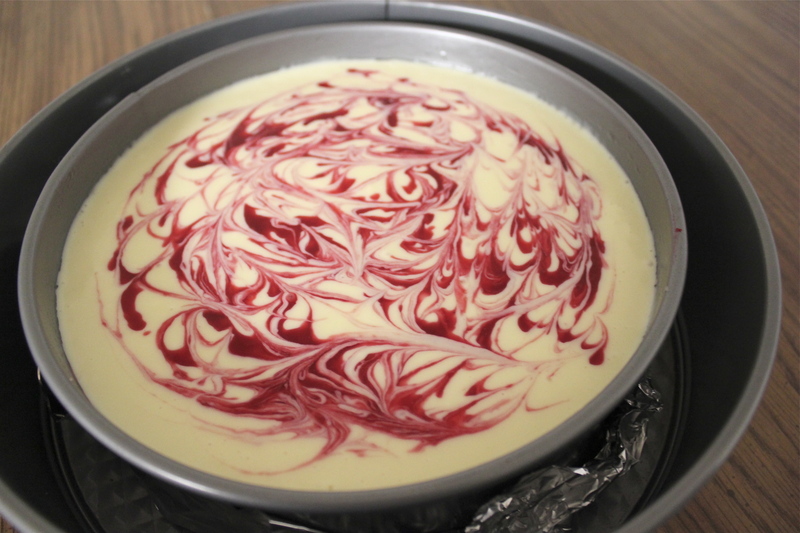 Spoon the pastry cream onto the cake and spread evenly. Place another cake layer onto the filling, top side up. Pour the glaze onto the center of the cake. 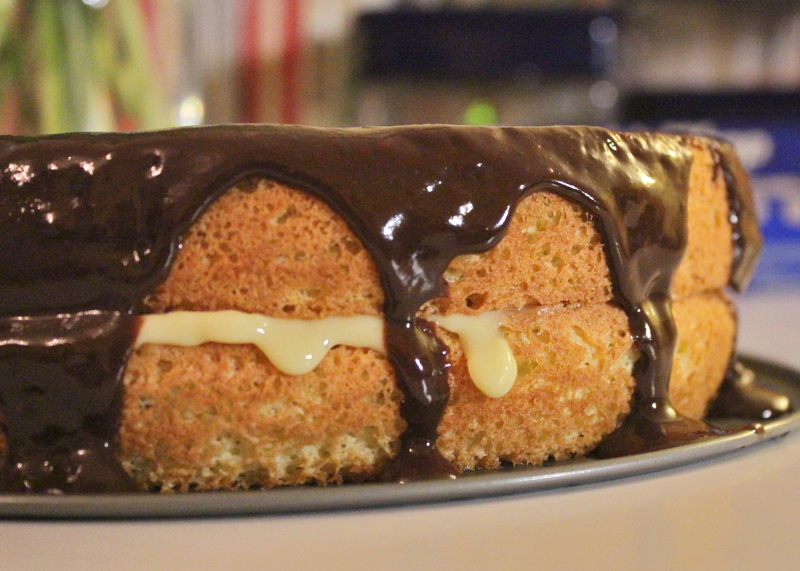 Spread the glaze to the edges of the cake, allowing it to drip down the sides. (There will be a lot of chocolate! I used a little less than what I actually made.) Let the cake sit until the glaze sets (otherwise, if you do what I did and don’t wait, you’ll have a very hard time cutting slices. Hence, no pictures of the cut cake in this post). 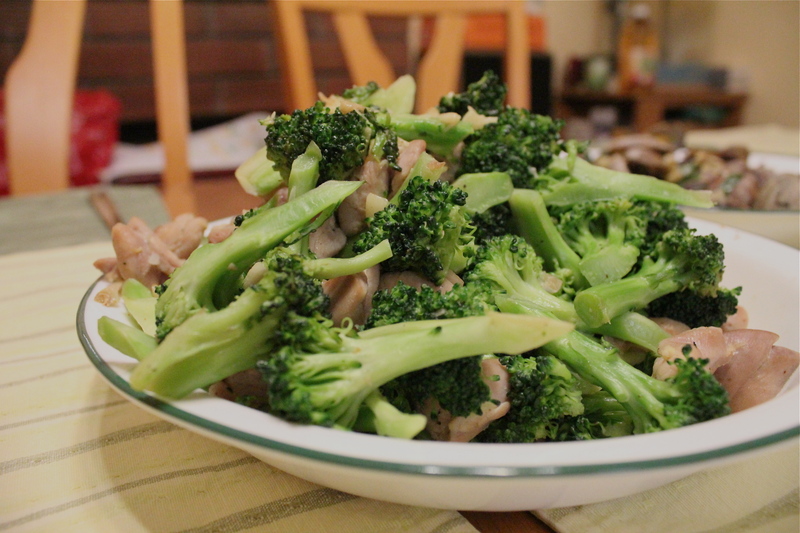 Refrigerate any leftovers! What a cutie. I’m so glad I had the opportunity to cook with my cousin and sister, and I’m even more thankful to have wonderful women like my mother and my aunt in my life. I hope they had as much fun as we did! And I don’t know if they’ll ever see this post (I actually don’t know if my mom reads my blog, but I do know she tells her friends about it to give me “business.” HAHA she always tells me that she should be my business consultant! ), but I hope they do know that we love them =). 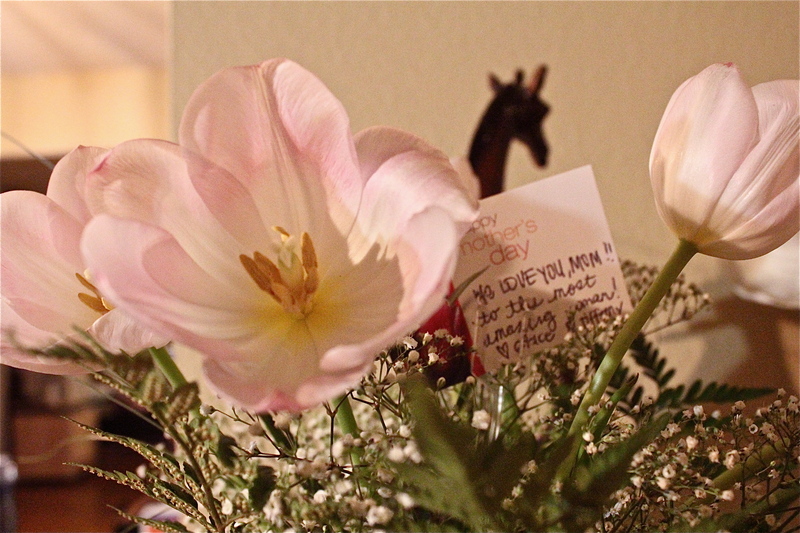 I hope you all had a wonderful and blessed Mother’s Day! What did you do for Mother’s Day, and why are you thankful for your mother? Soli Deo Gloria, and Happy reading, eating and baking! Accepting the realities of my God-given personality has been a process of sanctification. I’ve had to repent of people-pleasing and trying to be someone I’m not. I’ve had to humbly acknowledge my limits and weaknesses and to live in God’s strength rather than my own. Ultimately, this process has been about God and his kingdom, not me. The more I rest in his gracious acceptance of me in Jesus, the more free I become to be myself for his glory. And that’s a place where joy and contentment abound. Food for thought. And since summer is still a few weeks away, I’ll have to stick with spring, all the while remaining content and willing to love and invest in others, being patient with school, and being thankful that I can still receive an education. (or 1/2 cup milk + 1/2 teaspoon white vinegar/lemon juice. Place the metal bowl on top of the saucepan and stir with a rubber spatula or wooden spoon. The mixture will begin to thicken in about 10 minutes. Turn off the heat; whisk in the sliced butter. Wait for the slice to completely melt before adding the next one. Pour the lemon curd into a glass jar/container, and allow it to cool. Refrigerate over night before using. In a medium bowl, whisk together the cake flour, baking powder, baking soda, and salt. Set aside. In another bowl, beat eggs for 20 seconds. Add sugar and continue to beat for 30 seconds. Add vanilla and oil; beat. Stir in half of the flour mixture, then add half of the milk. Add the rest of the flour and then the rest of the milk, and mix until just combined. The batter will be very thin. 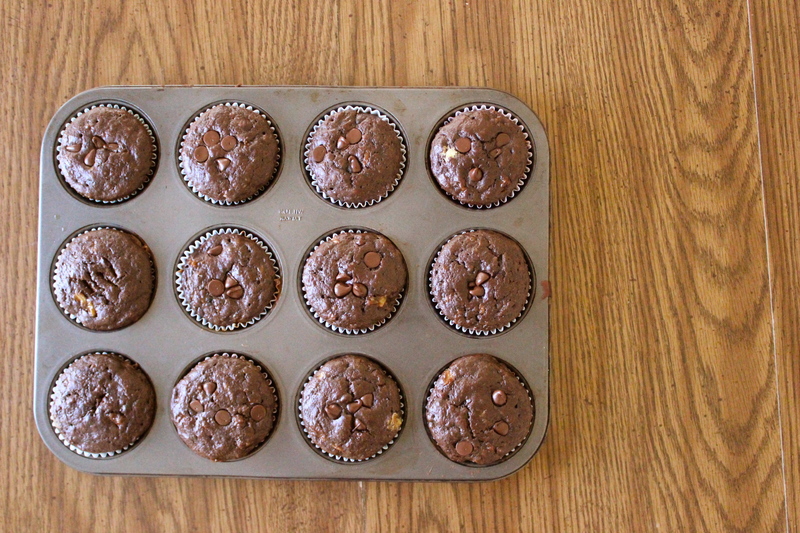 Pour the batter into a cupcake pan lined with paper liners, and fill the liners about 2/3 full. The cupcakes will rise a lot during baking! 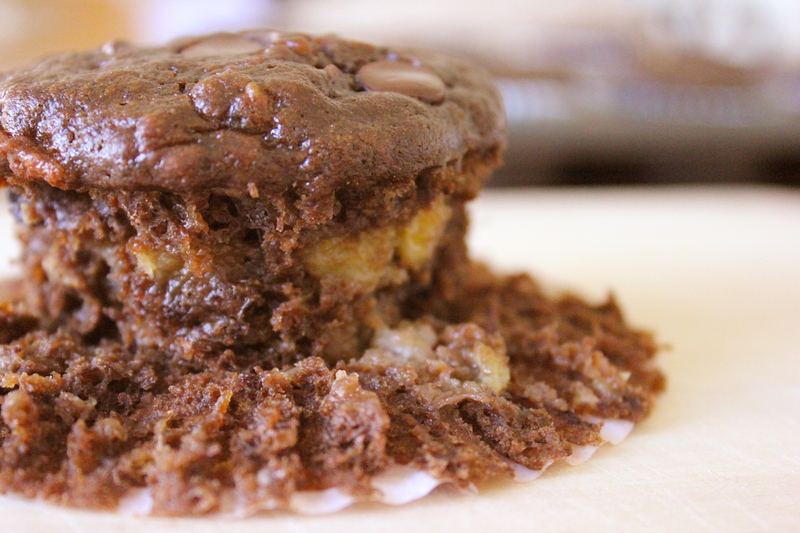 Bake cupcake in preheated oven for 12-14 minutes, or until toothpick inserted in center comes out clean. 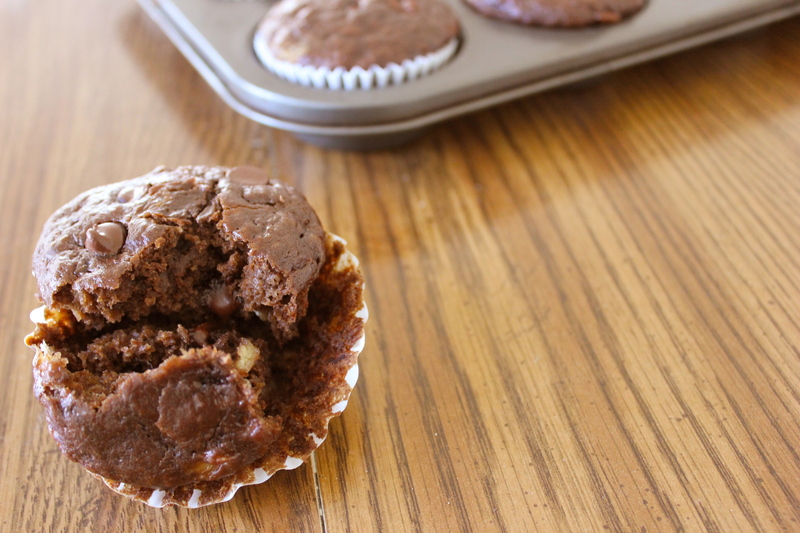 Cool in pan for 1-2 minutes, then remove cupcakes from pan and finish cooling on a wire rack. Place butter in a mixing bowl; beat until smooth. Add the powdered sugar and beat until light and fluffy. Add the vanilla and strawberry puree (which is just strawberries blended in a food processor/blender/coffee grinder); beat until combined. 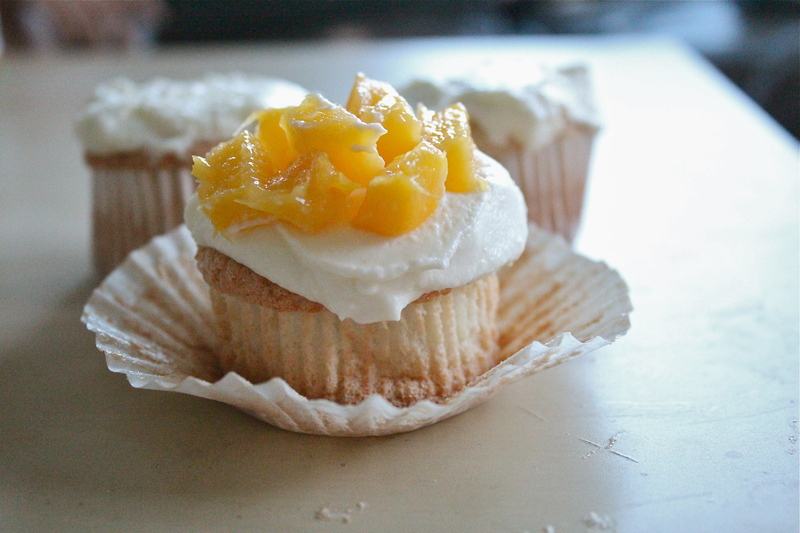 When the cupcakes are cool, core out the middle of each cupcake and fill generously with lemon curd. 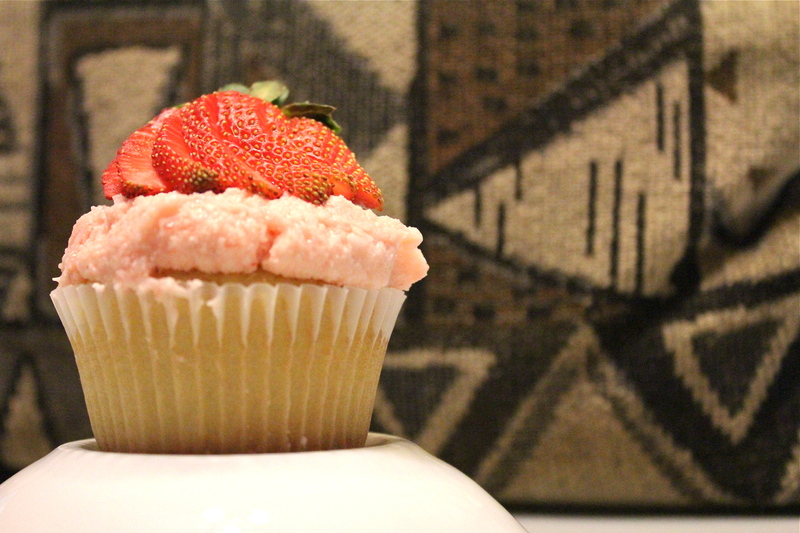 Frost each cupcake with the strawberry frosting. Top with strawberries, if desired. 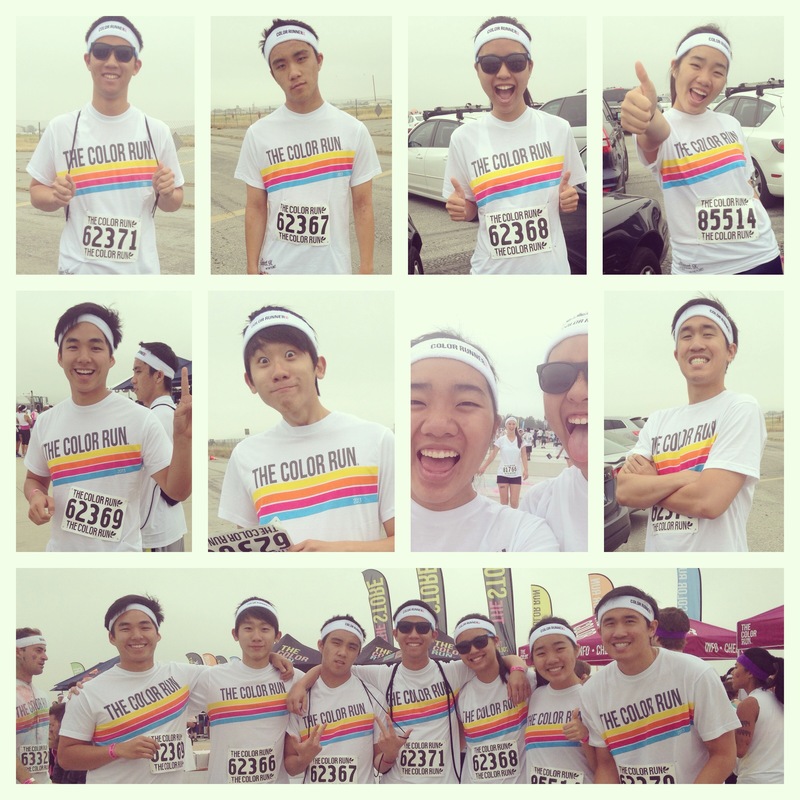 Color Run 2013: We’re Ready!!! 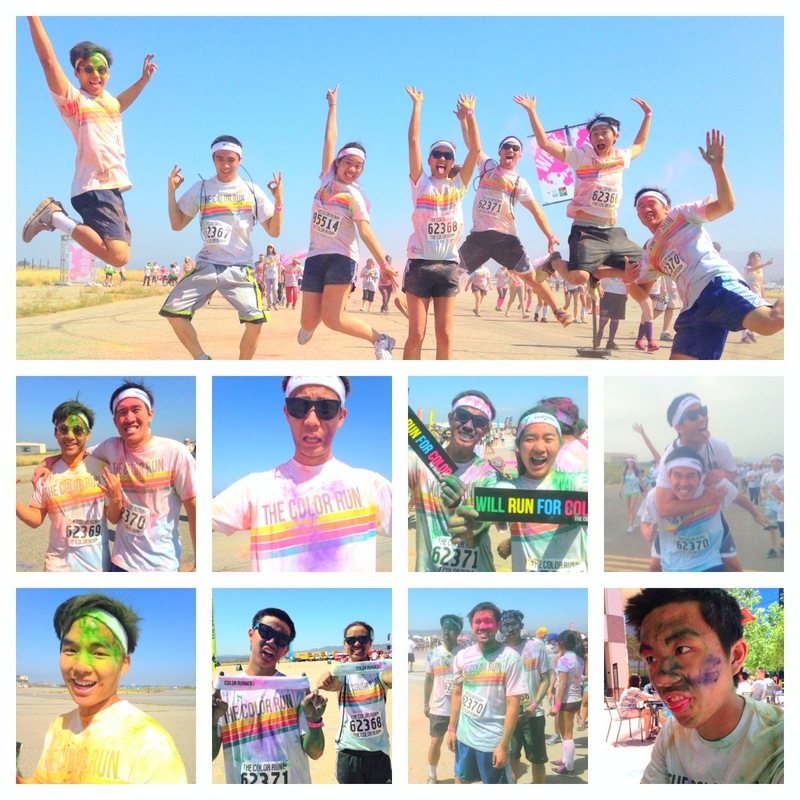 Color Run 2013: Bright Colors for a happy finish!!! 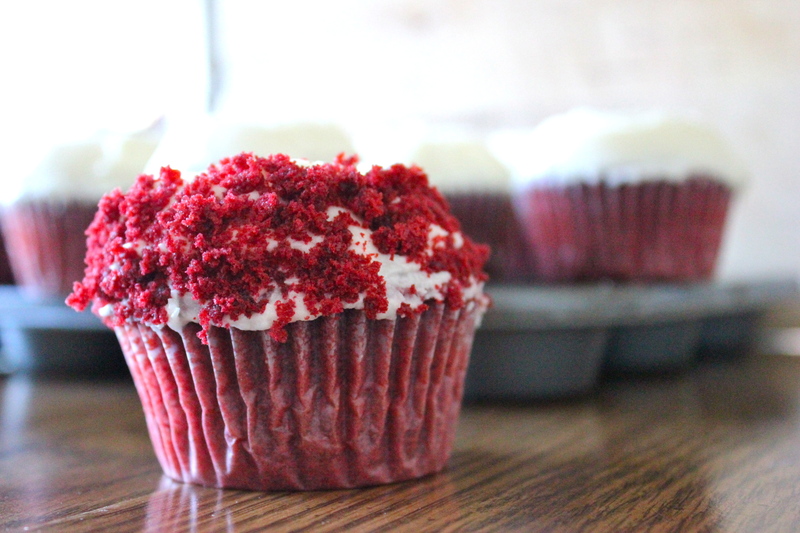 Speaking of color…red velvet cupcakes!!!!! 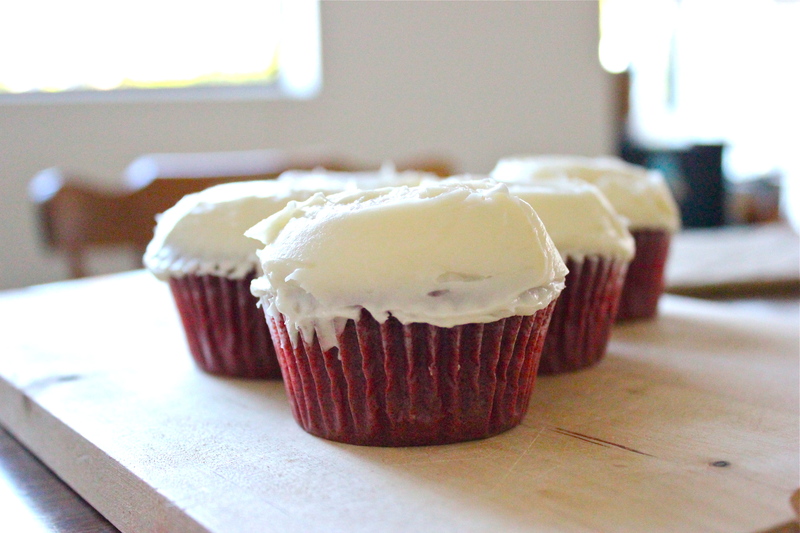 The first time I made red velvet cupcakes was for J’s birthday two years ago. 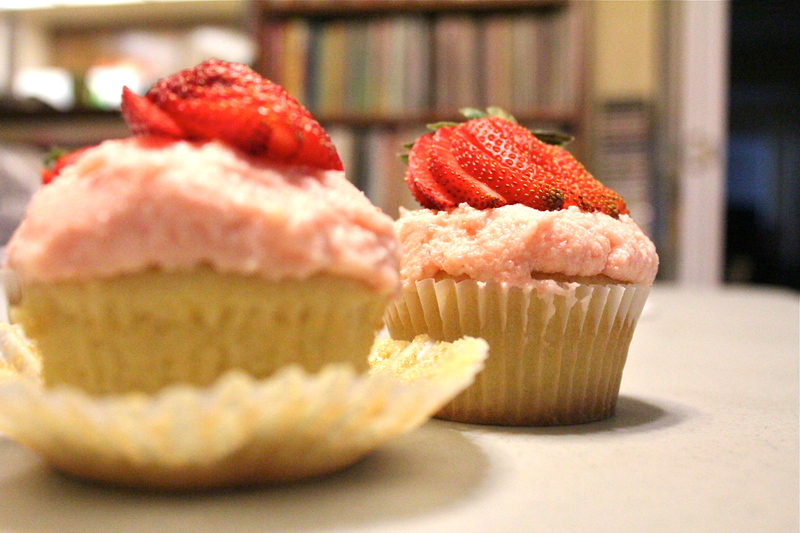 It was from a boxed cake mix, and the cupcakes actually came out nicely. But…the frosting was terrible! At the time, I didn’t know there was a difference between margarine and butter except for the fact that margarine was definitely cheaper. The frosting was runny, and I tried adding more sugar, but it never stiffened up. It was a disaster! I had to toss the whole thing out =(. 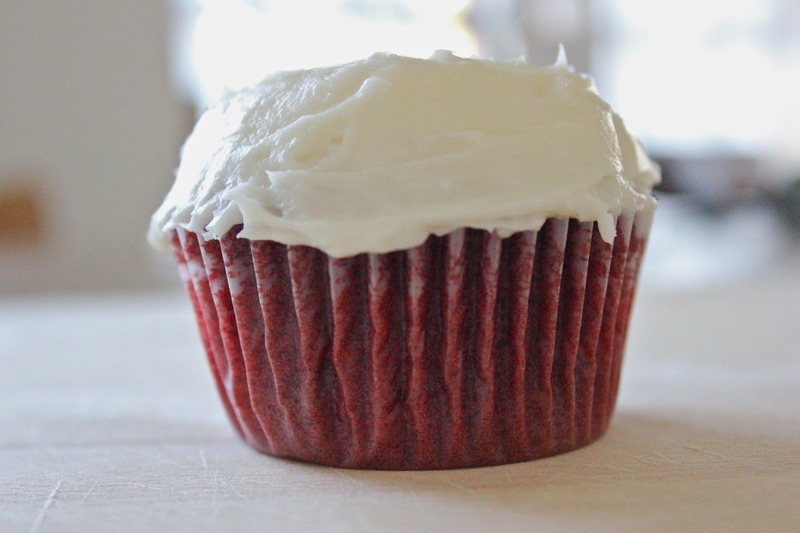 The red velvets this time around were beautiful, and the frosting was creamy and 100% spreadable! 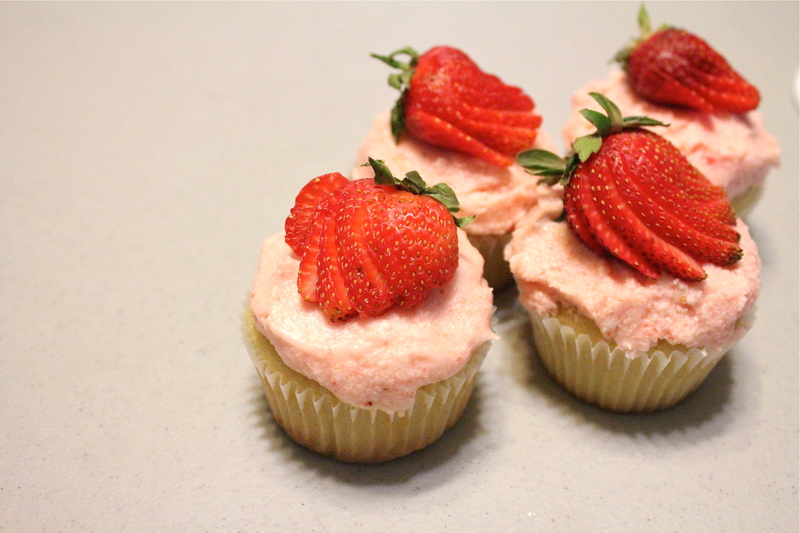 I actually bookmarked this recipe on Cooking Classy (you should definitely check it out; everything I’ve made from that blog has been delicious, like my Angel Food Cupcakes!) 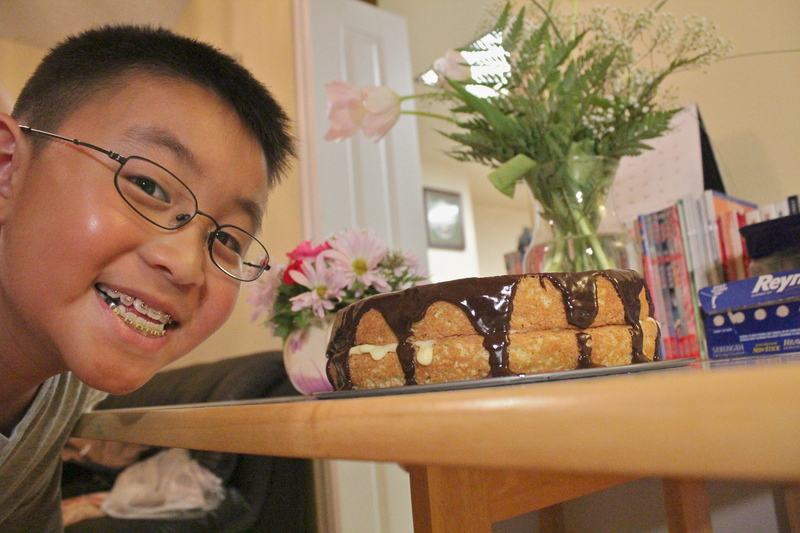 a while ago, and I finally got around to it last Friday (Friday are my baking days, remember?). 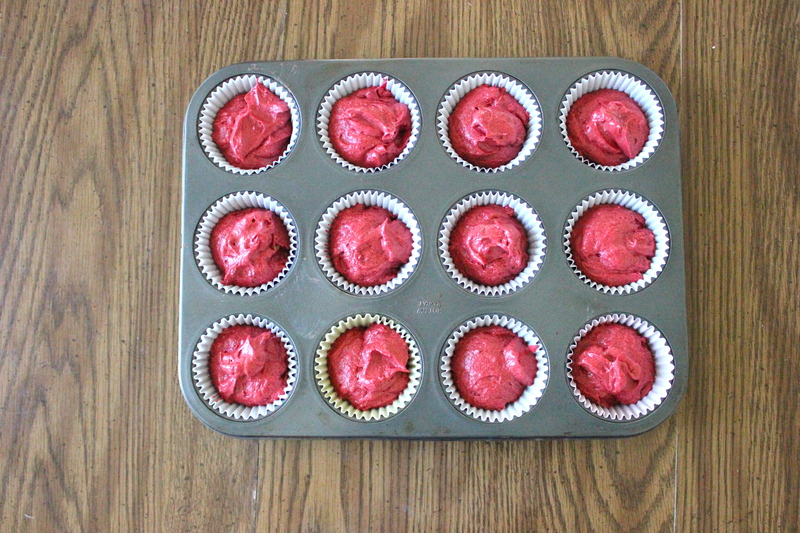 Anyways, these cupcakes are supposed to be a Sprinkles copycat, but considering how I’ve never had a Sprinkles red velvet cupcake, I can’t really say for sure. 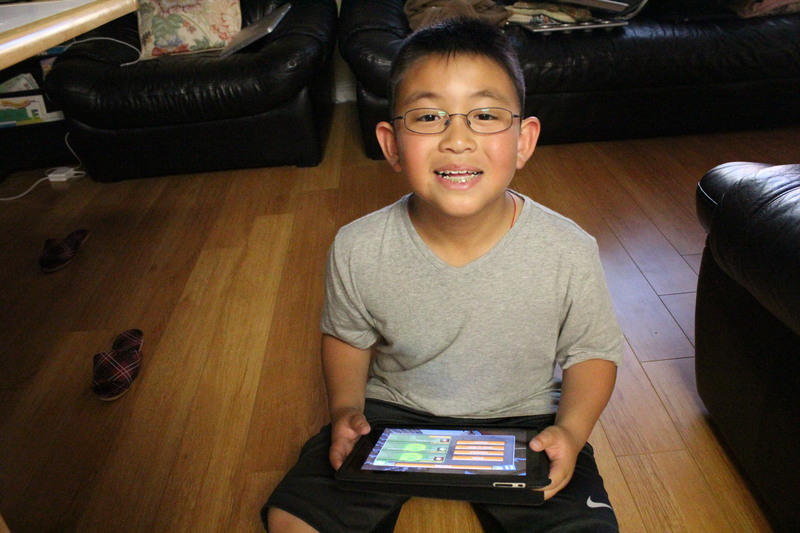 But my friend who’s had both says it comes pretty close (shoutout to beat the rice!)! Whether or not it’s a copycat, it’s delicious, and the cream cheese frosting tops it off perfectly. 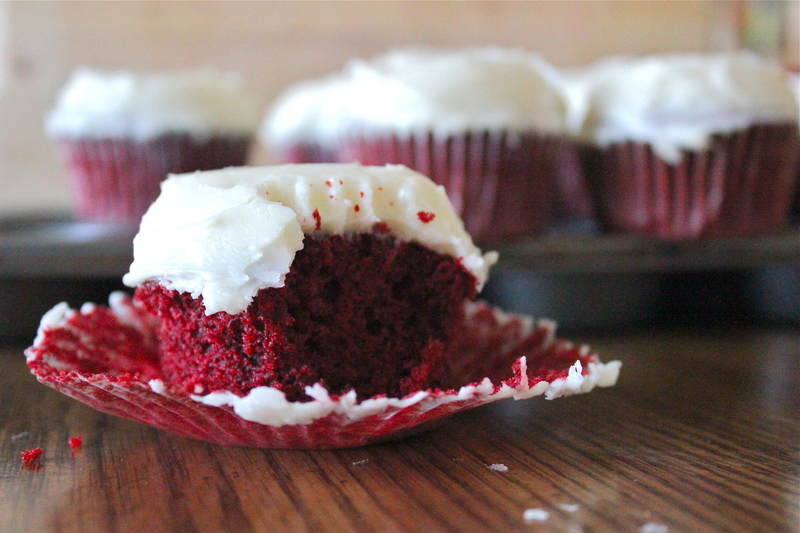 But here’s the thing…I don’t really understand the whole deal with red velvet cupcakes. They’re loaded with food coloring, and they barely have any chocolate flavor…but they look so cool! 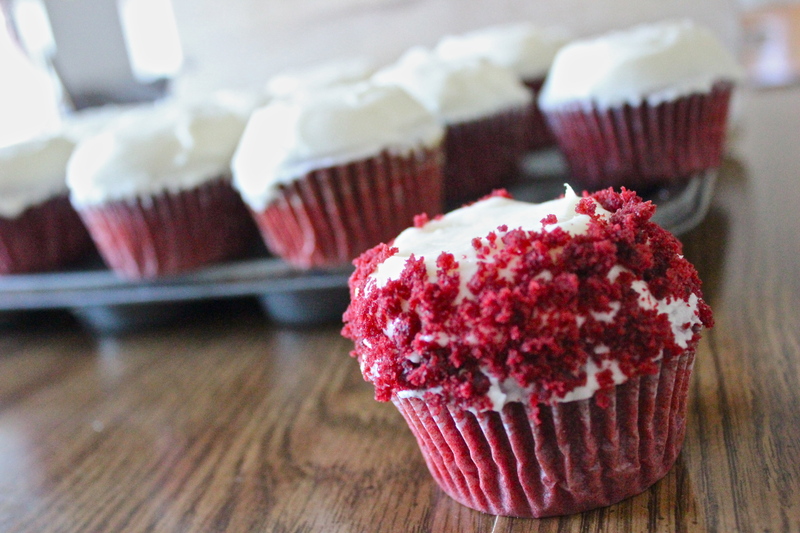 There’s just something special about a red velvet cupcake; it makes me feel kinda fancy =). Is that weird? Hehe. Preheat the oven to 350˚F. In a mixing bowl, whisk together flour, cocoa powder, baking soda, and salt; set aside. In another large bowl, cream the butter and sugar until pale and fluffy for about 3-4 minutes. Stir in eggs, one at a time. Add the red food coloring and vanilla extract, and mix to combine. Be careful not to splash on yourself. Trust me, the food coloring stains! In another small bowl, combine the milk and vinegar. Add the milk mixture and the flour mixture to the cupcake mixture (the one with food coloring), alternating in two separate batches and mixing until combined after each addition. 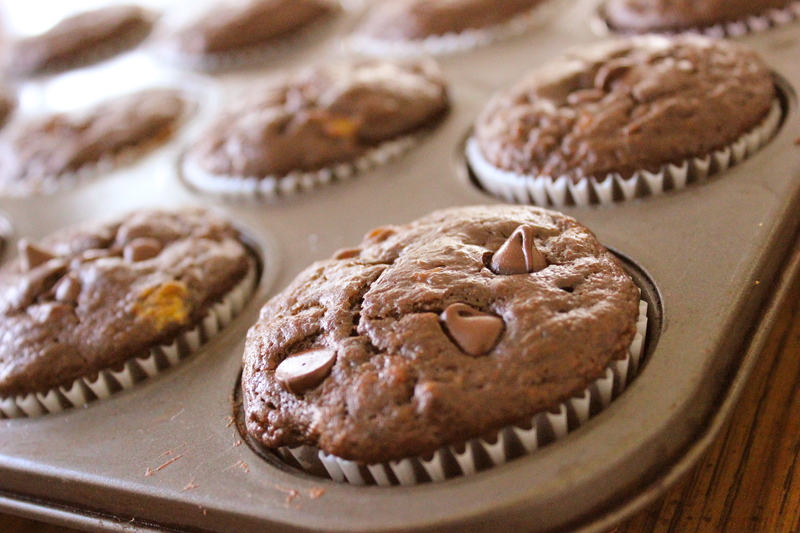 Divide the batter evenly among paper lined muffin cups, and fill each cup about 2/3 full. 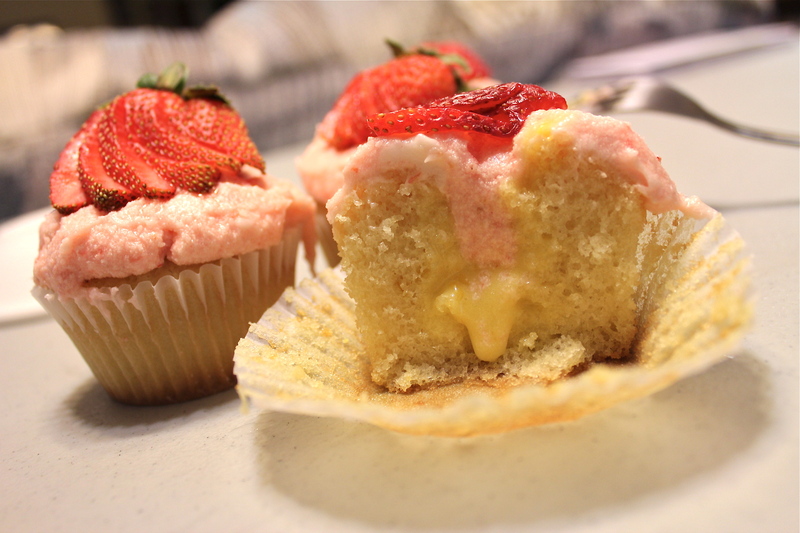 Bake in a preheated oven for 18-21 minutes until a toothpick inserted into the center of the cupcake comes out clean. Remove from oven and cool completely before frosting. For the frosting, cream together the butter and cream cheese until pale and fluffy, about 4-5 minutes. Mix in the vanilla extract, and add the powdered sugar and beat until smooth. 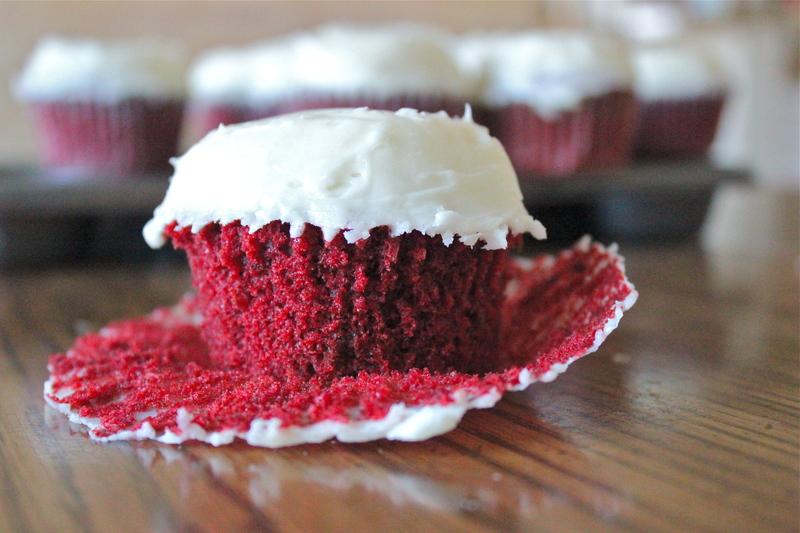 Spread onto cooled red velvet cupcakes. I tried frosting them the same way Sprinkles does…I think Sprinkles looks much better. I tried! A for effort? 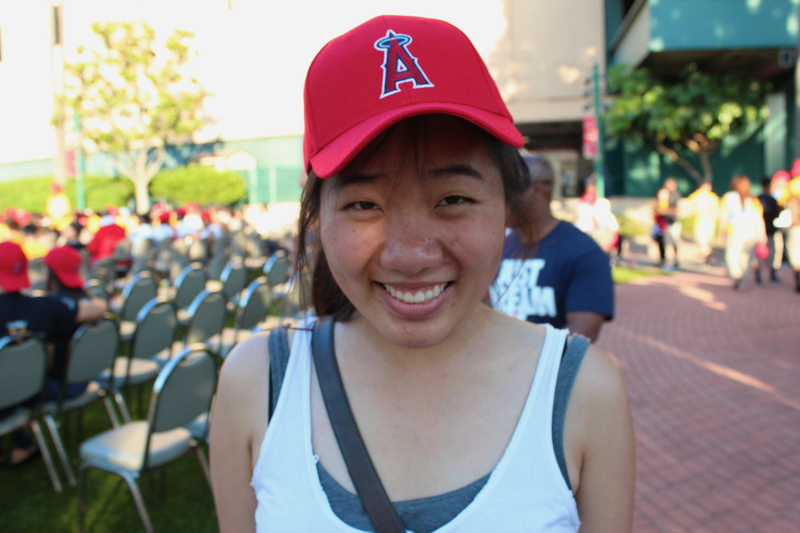 My sister’s work had extra tickets for the Anaheim Angels v. Kansas City Royals game Monday night. I’d have to say, it was pretty exciting! 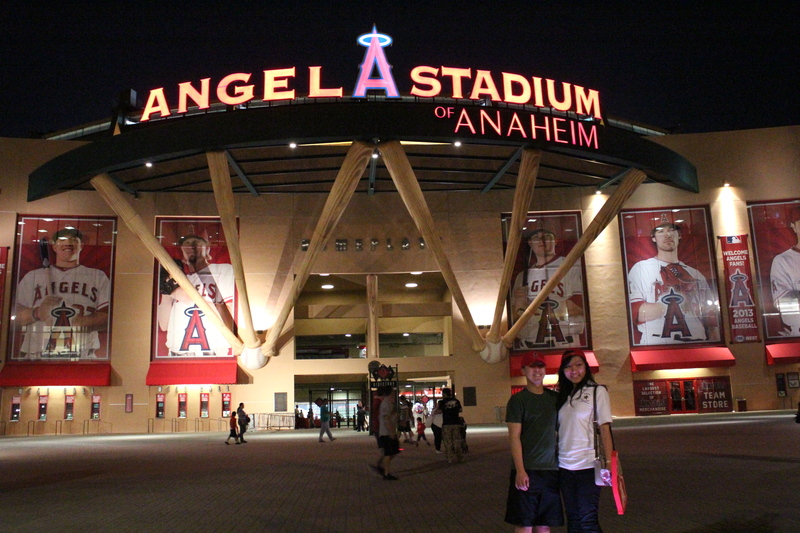 I got there a few hours early with a friend (Angels fan! 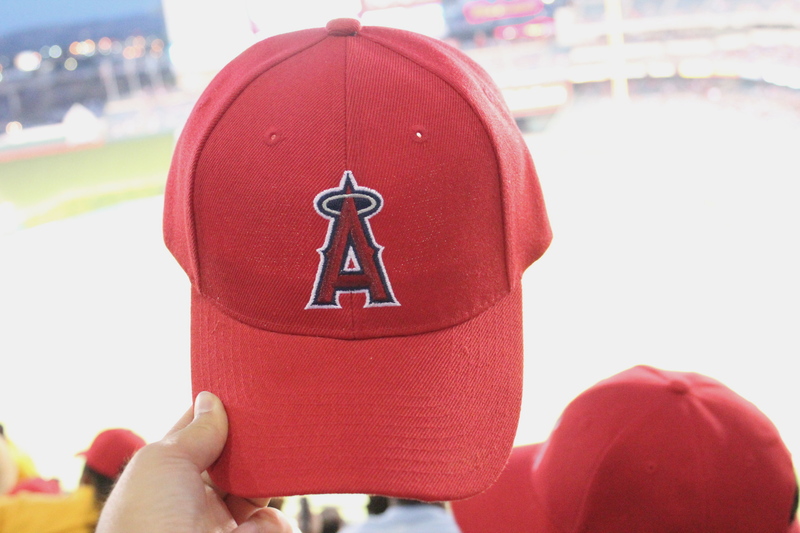 Trout fan, I think) who met me there. We waited for my sister and her students to get there, but the bus took a while because it was stuck in traffic. 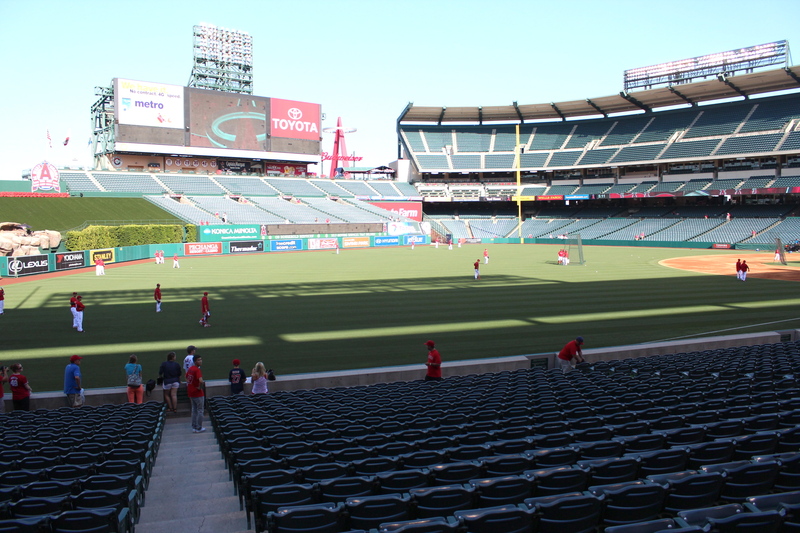 Anyway, I got the chance to explore the stadium and watch the players practice on an empty field (which is kept beautifully, by the way). The students finally got to the stadium at around 5:40 (the game was at 7), and there was a special ceremony for their school and other schools for a program they were a part of. 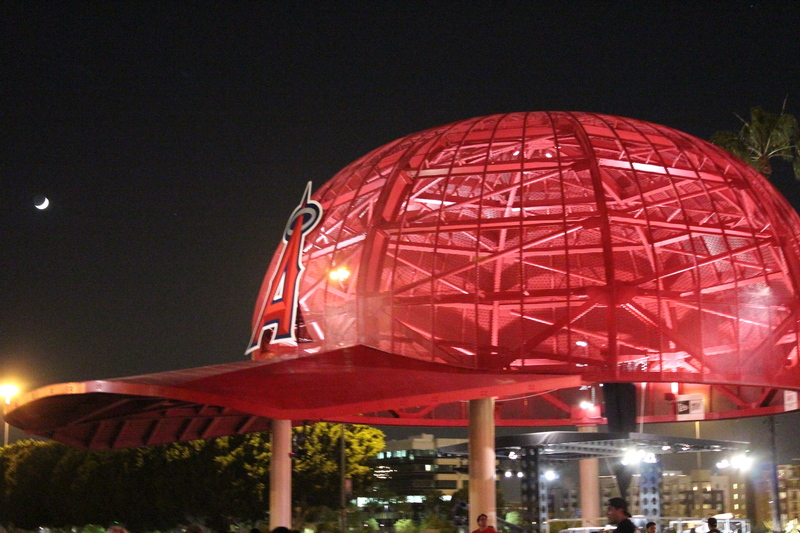 It was a little long, but we all got free caps and hot dogs in the end, so it was worth it =). 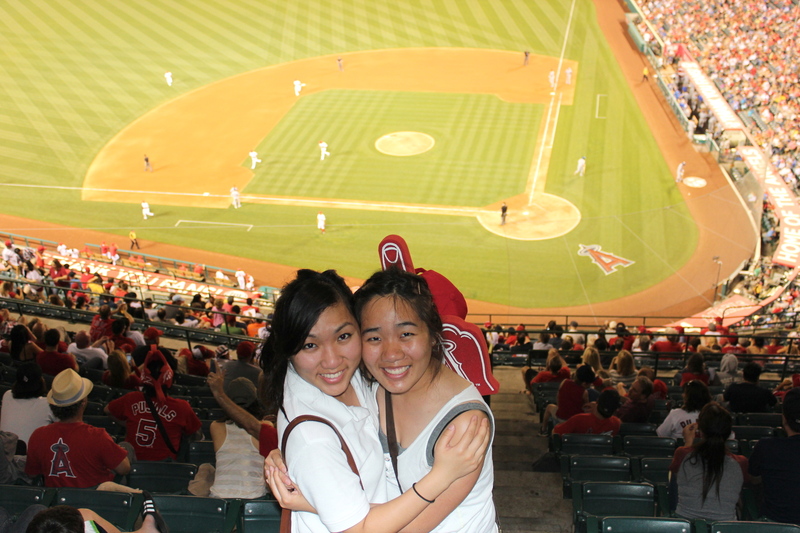 The game started at around 7, and our seats were at the tippy top. 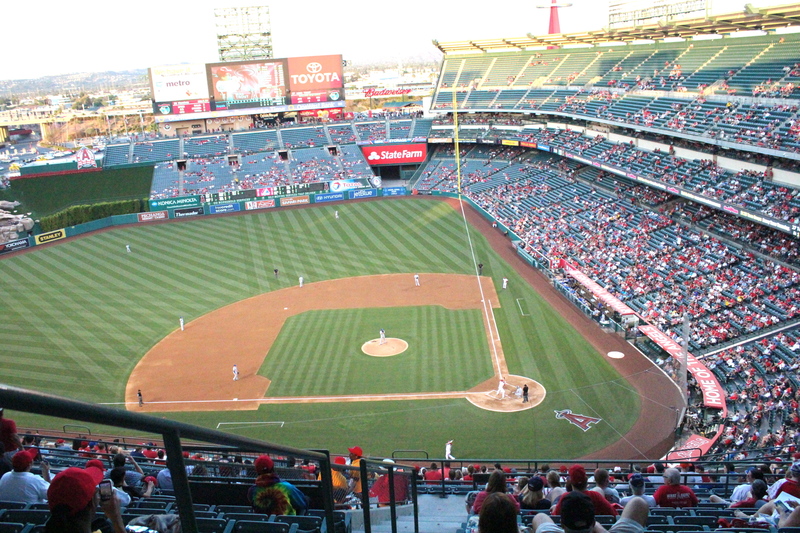 I sat in the wrong section for a good 15 minutes, because it was so high up I was too scared to move. I eventually moved, watched the game (which I didn’t really get, but it’s okay), moved about 5 more times because annoying little bugs kept collecting around the light, and finished the game with some good company. It was fun to see people into the game (in the beginning at least! 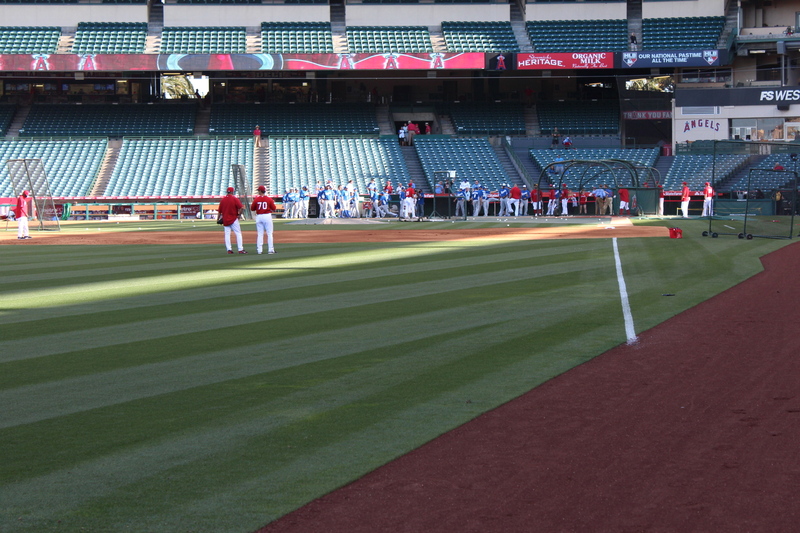 ), and the different cameras and funnies on the big screen. I think my favorite parts were seeing all the students excited to be at the game and being at the game and experiencing the culture. I’m thankful I got to go! 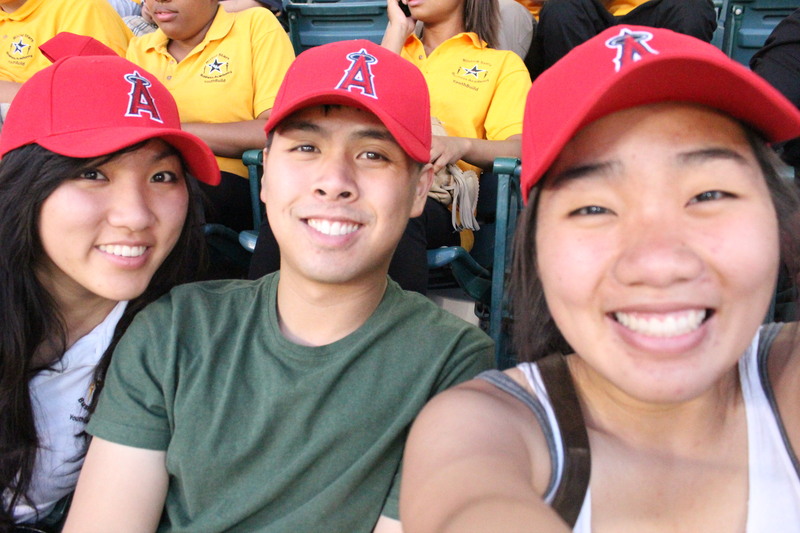 I mean, the game wasn’t the greatest in terms of the score (the Angels were 4-11 when we left after the 7th inning), but the fact that it was my first sporting event was definitely a highlight. It was a great start for the week! 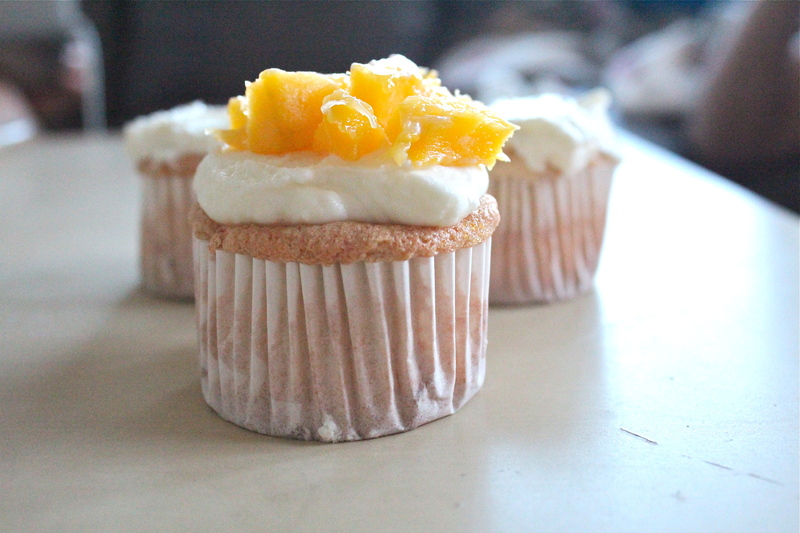 2) Angel food cupcakes. It was definitely not planned. 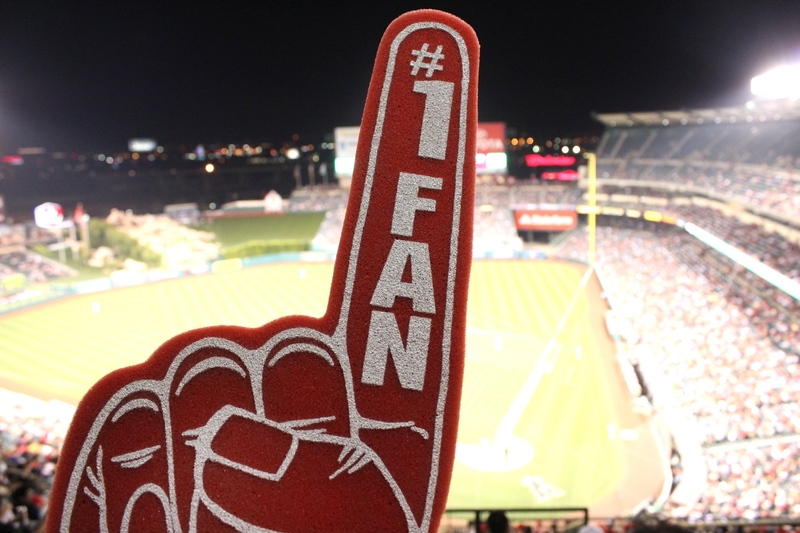 I didn’t realize that I would be blogging about both my Angels game experience and my angel food cupcakes in the same post until I had already started. I laughed to myself and told my roommates…they thought I was a weirdo, but I know they laughed, hehe. It was another one of those days where I had limited ingredients and had to scrounge in the kitchen. I had extra egg whites (which usually never happens since I make macarons…but I didn’t get the chance to this time around) and cream cheese from red velvet cupcakes (recipe coming soon!). I found this recipe on Cooking Classy and halved it to fit my needs. 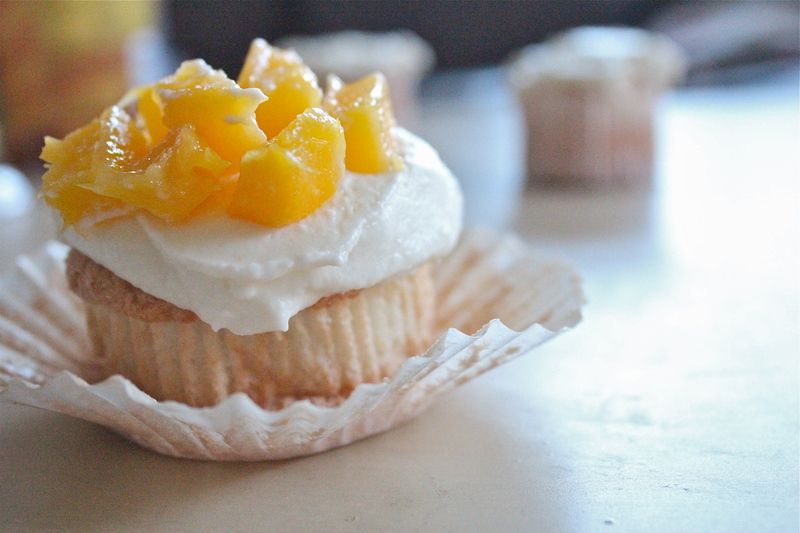 It was delicious and even better the next day–the cupcake was so soft and fluffy, and the cream cheese-whipped cream and diced mangoes accompanied the cupcakes perfectly. I can’t wait to try these again! Oh, and the following recipe is the original recipe. I halved it when I made mine. Enjoy! Preheat the oven to 350˚F. In a food processor or coffee grinder, pulse the sugar until super fine. In another bowl, sift together half the sugar, cake flour, and salt. In a large mixing bowl, whisk together the egg whites, water, extract, and cream of tartar until frothy. Whip the mixture white slowly adding the remaining sugar to egg white mixture, until medium peaks form. Sift some of the flour mixture to evenly dust the top of the egg white mixture, and gently fold the flour into the egg white mixture with a spatula. Repeat this process until all of the flour mixture is incorporated. Divide the batter among paper lined cupcake tins; fill each cup nearly full. The batter will be very thick. Bake for 18-20 minutes until golden and a toothpick inserted into the center comes out clean. Let cool completely before topping it with the cream. For the cream cheese whipped cream topping, whip the heavy cream until soft peaks form in a mixing bowl. In another bowl, whip the cream cheese until light and fluffy. Add the cream cheese and powdered sugar to the whipped cream and whip until stiff peaks form. 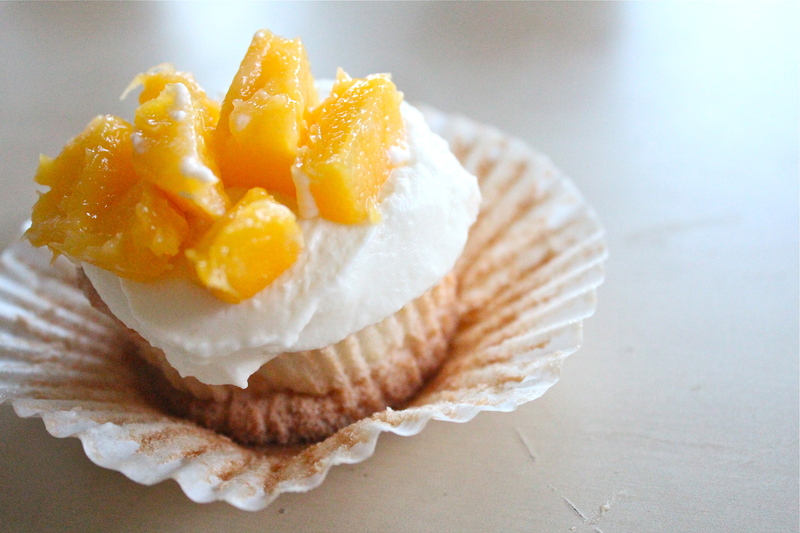 Top the cooled cupcakes with the whipped cream topping. Top with fruit, if desired. Store in the refrigerator. Now cookies. 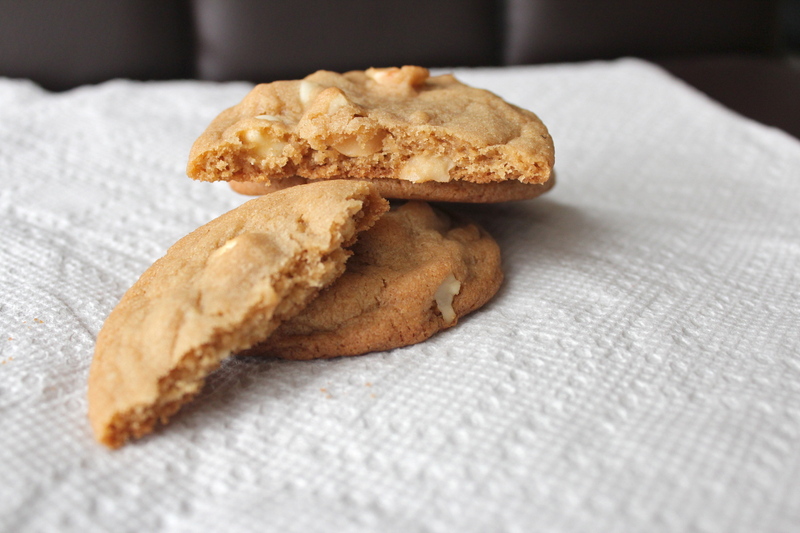 I actually made them with my roommate Sam this past week in the midst of midterms as a study break. We both measured, I mixed, and then she did the rest. I think I was a little skeptical about this recipe at first, I guess partially because there’s this glaze that goes along the cookie. I’ve never done a glaze on a cookie before, but it’s actually really good; it’s nice and tart (but you can control that!) and it just soaks into the cookie. 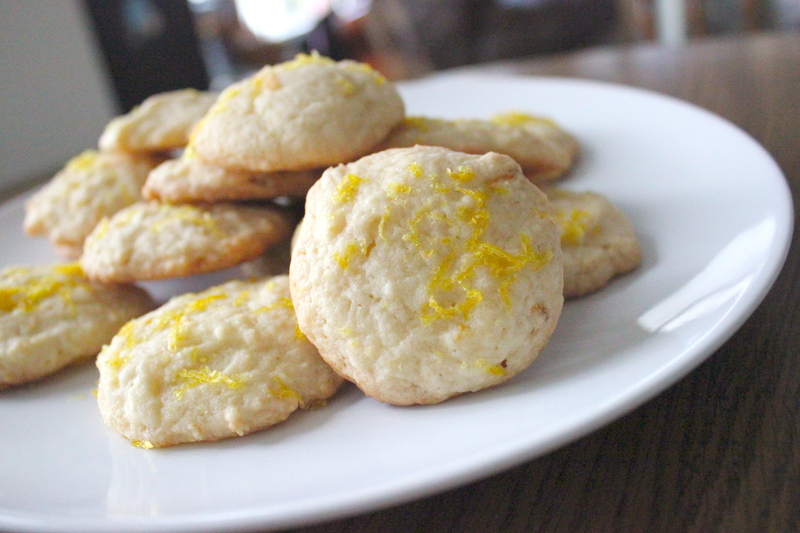 There’s zest and lemon juice in the cookie dough and in the glaze, so you get a strong lemon flavor throughout. AND IT SMELLS SO GOOD. 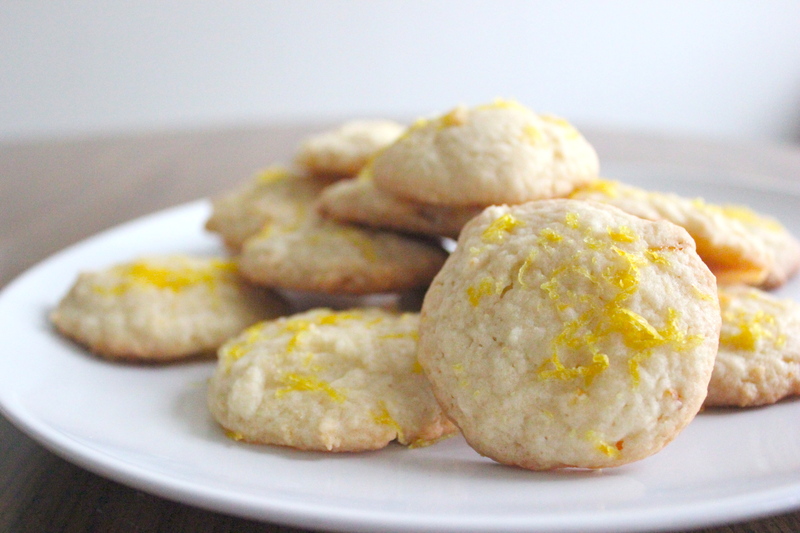 I think it’s kind of like a lemon bar in a non-sticky cookie form! 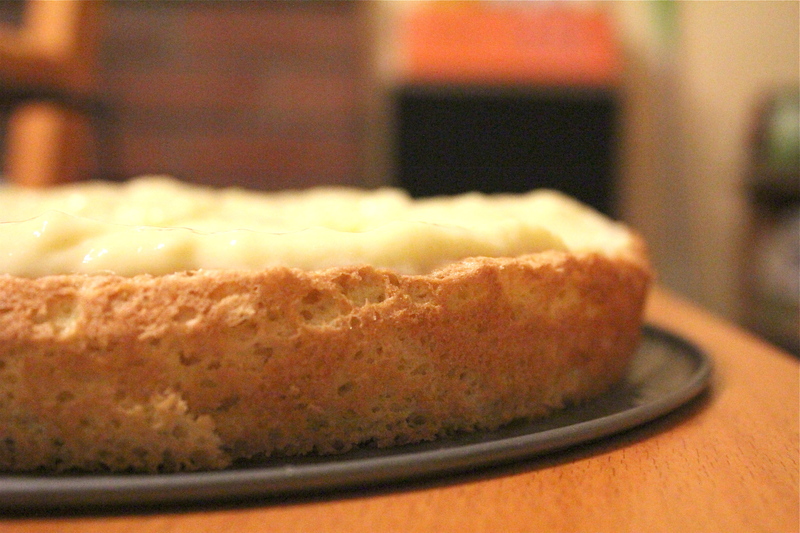 I like it tart, but if you’re not a fan of that, you can decrease the amount of lemon zest/juice. 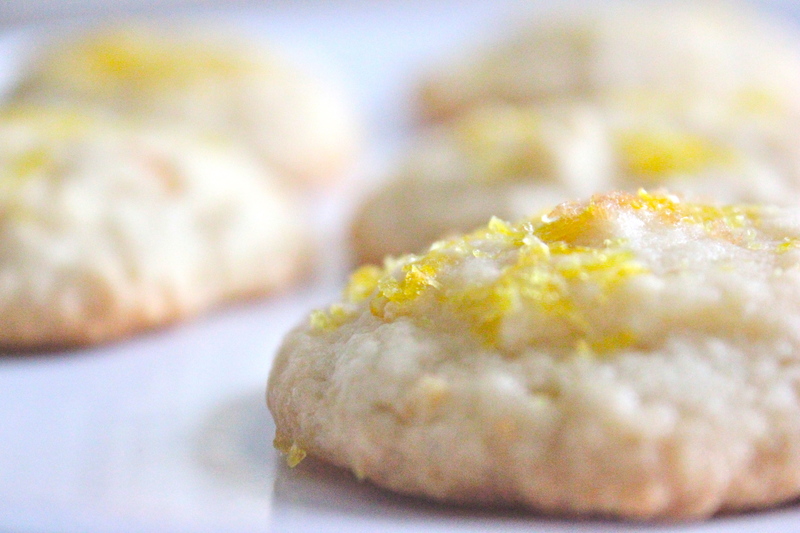 In a medium bowl, mix together the flour, baking soda, salt, and lemon zest. In a large bowl, cream the butter and granulated sugar until light and fluffy. Add the egg, vanilla and lemon juice; beat until combined. Stir in the flour mixture. 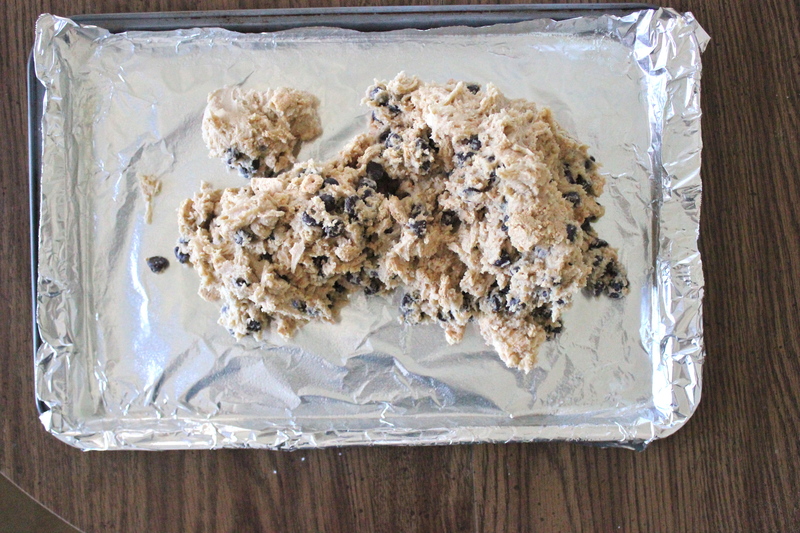 Drop the dough by tablespoon dollops, about 1 inch apart onto two lined baking sheets. Bake until the edges are golden, about 15 to 20 minutes. Meanwhile, make the lemon glaze. 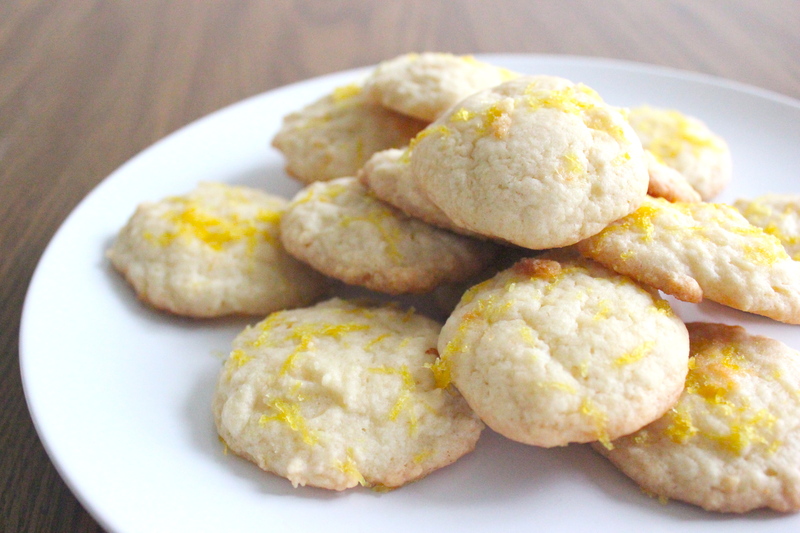 For the lemon glaze, whisk together the confectioners’ sugar, lemon zest, and lemon juice until smooth. When the cookies are done, cool them on wire racks, and then spread the tops of the cookies with the lemon glaze and let set, about an hour. 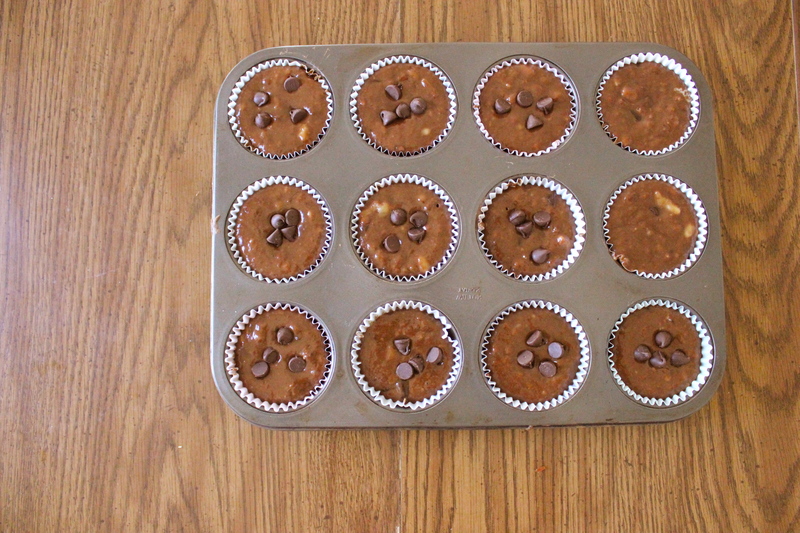 As you all probably know, Fridays are my baking days. Baking days are easy when you have a kitchen stocked with butter, sugar, flour, baking pans, etc…but when you’re missing some of the ingredients, your baking options DROP. That’s what happened to me. We only had two sticks of butter, so that meant no cupcakes+frosting. It made room for cookies….but we ran out of granulated sugar. We were low on bread flour, so that meant no pretzels or rolls and whatnot. 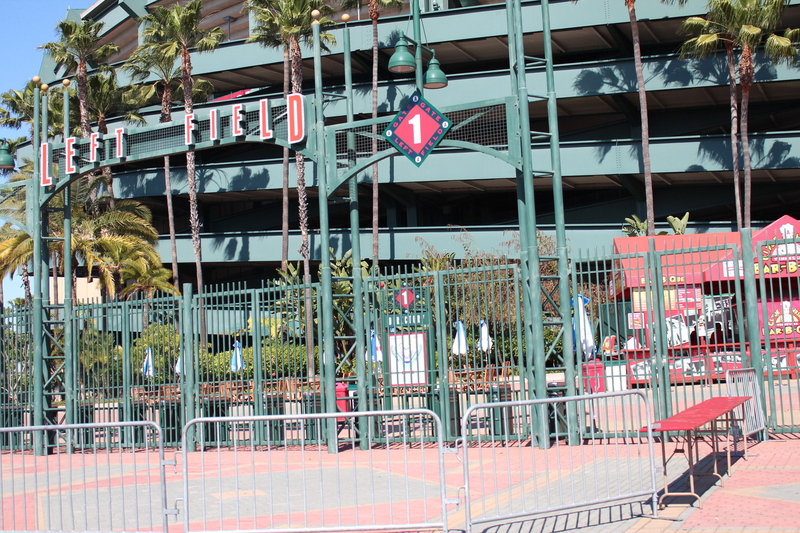 And yes, the market is literally a 5-10 minute walk, but I really wasn’t in the mood to go out. And when that happens…I scrounge. 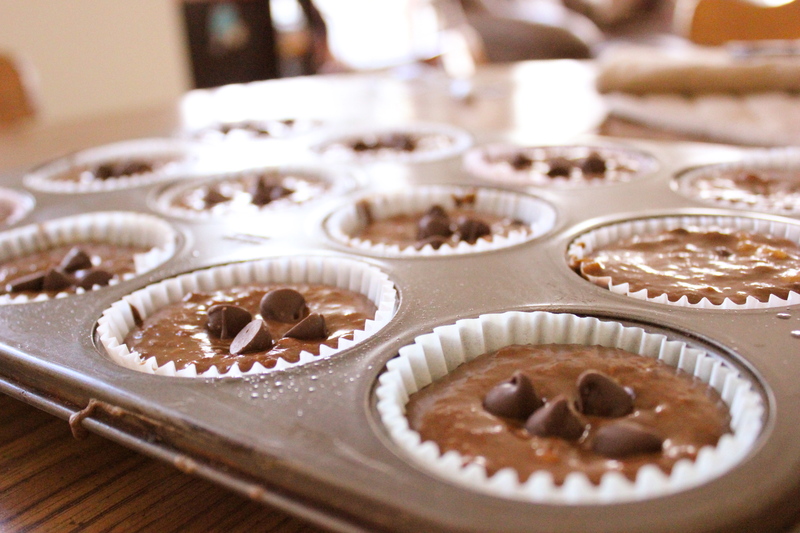 Preheat the oven to 350°F and line a 12-cup standard muffin pan with baking cups. In a large bowl, mix together the flour, cocoa, baking power, baking soda, cinnamon, and salt. In another bowl, mix together the egg, honey, oil, vanilla, banana, and buttermilk (you can use substitute buttermilk with milk and vinegar. Add one tablespoon of white vinegar or lemon juice in a measuring cup, then add enough milk to bring it to one cup. Mix, then let stand, and use however much the recipe calls for). Add the wet mixture to the flour mixture and stir until just combined. 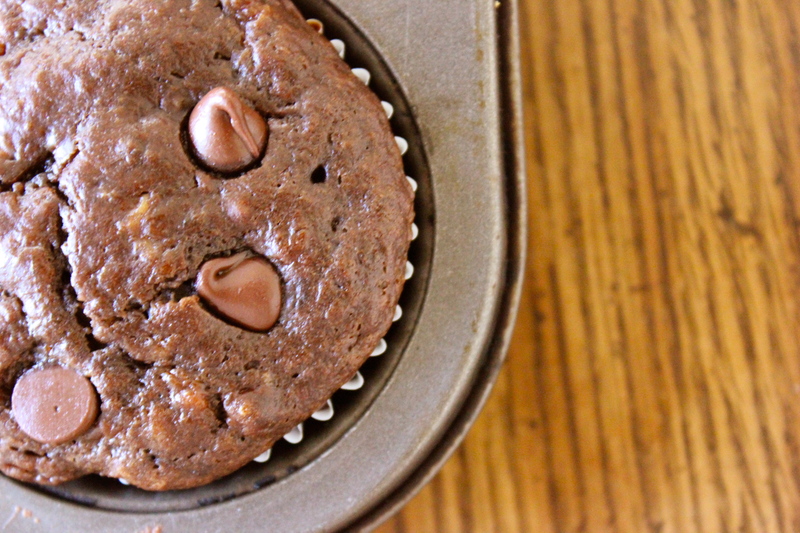 Fold in 1/4 cup chocolate chips. 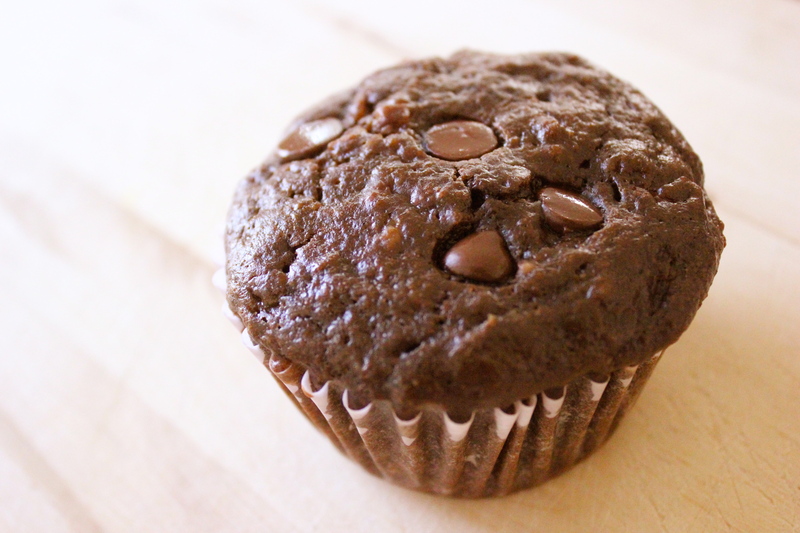 Fill each cup 3/4 full of batter; sprinkle some chocolate chips over the tops of the muffins (I used 4 semi sweet chips per muffin top). 1) water bath. I didn’t have a deep dish roasting pan, so I put it in a larger springform cake pan to bake (like the picture above). But then the larger springform pan started to leak, so I put it on top of a baking sheet, and filled that with water. I guess as long as it’s larger, you’ll be okay. 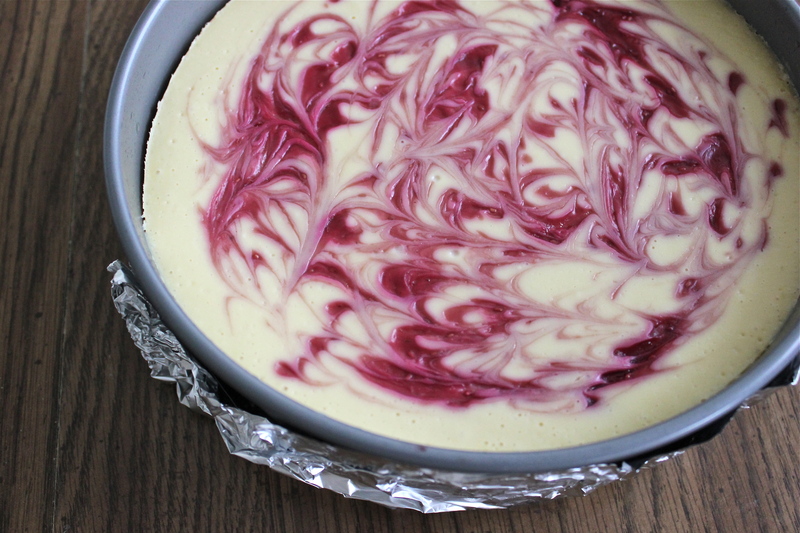 Make sure to cover the bottom of your cake pan with foil so water doesn’t leak into the cheesecake. 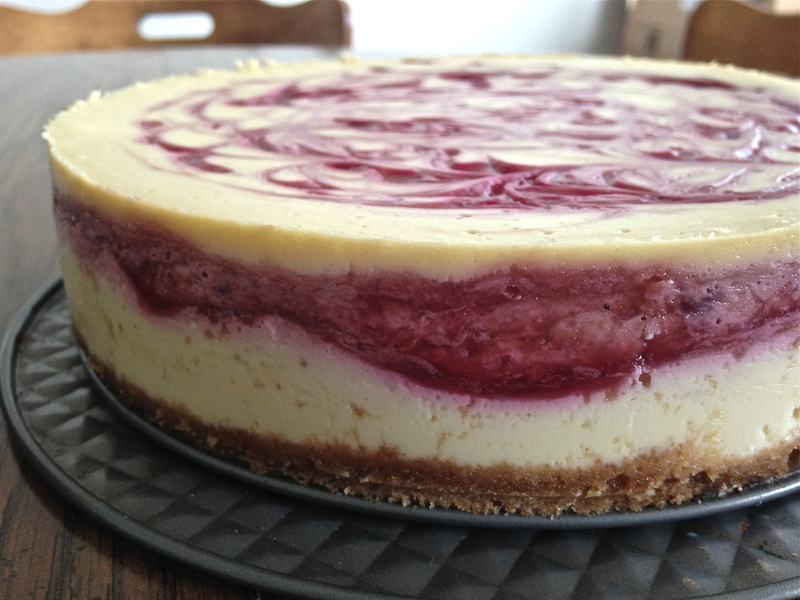 2) Make sure your cream cheese is at room temperature, otherwise you’ll end up with some chunky cheesecake. And make sure it’s completely creamy/fluffy (but don’t overmix!) before you add in the eggs and whatnot. it’ll be hard to get those lumps out once you add in other ingredients. 3) I used graham crackers instead of Oreos, because I had a bunch of leftover s’mores ingredients in the apartment. The recipe uses Oreos–the reviews have suggested to omit the butter since the cream from the Oreo cookies will be enough to keep the crumbs together. Your call! 4) I made my own raspberry sauce, but you can definitely use raspberry preserves. The reviews say to just use 6 tablespoons and microwave it for 30 seconds. You can check out the reviews on the site for more suggestions. Okay, I’m done. Here’s the recipe! Sorry it took me so long! :) Enjoy. 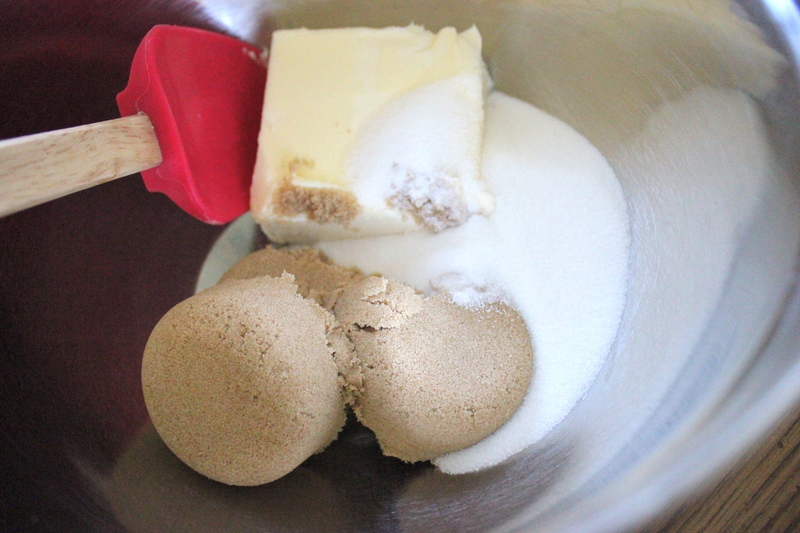 In a medium bowl, mix together graham cracker crumbs, 3 tablespoons sugar, and melted butter. Press the mixture into the bottom of your springform pan; I greased it with Pam. In a saucepan, combine raspberries, 2 tablespoons sugar, cornstarch, and water. Bring to a boil and continue boiling for another 5 minutes, or until the sauce is thick. Strain the sauce through a mesh strainer to remove the seeds. Keep the sauce, throw away the seeds. Preheat the oven to 325˚F. In a metal bowl over a pan of simmering water (make sure the bowl doesn’t touch the water), melt the white chocolate chips with the half-and-half cream, stirring until smooth. 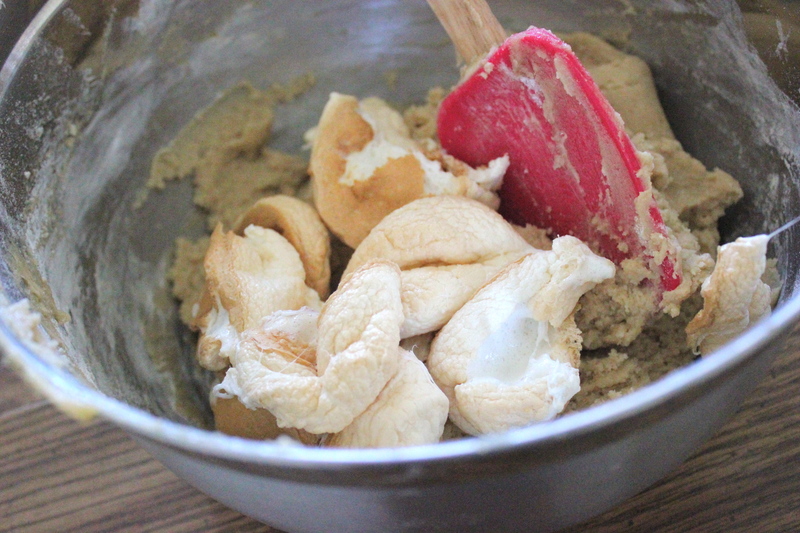 In a large bowl, mix together the cream cheese and 1/2 cup sugar until smooth. Make sure the mixture is completely smooth, then add in the eggs, beating them in one at a time. Blend in the vanilla and melted white chocolate. Pour half the batter over the crust, then spoon 3 tablespoons of the raspberry sauce over the batter. 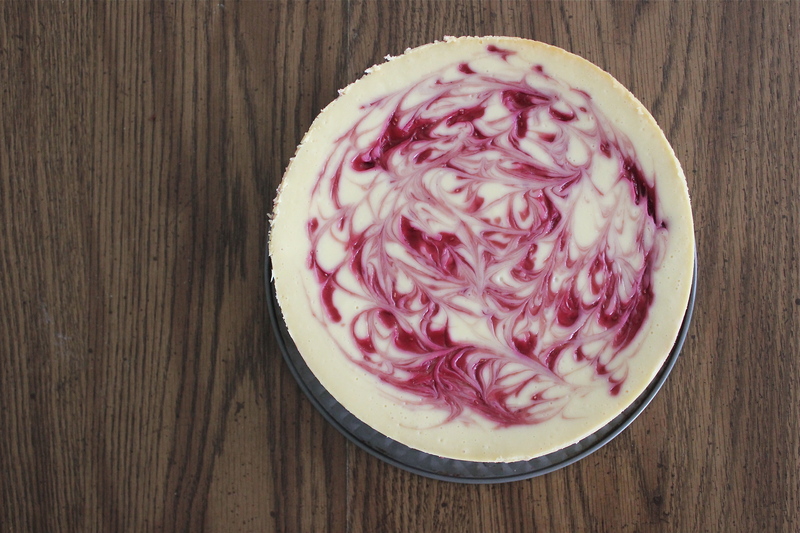 Pour in the rest of the cheesecake batter, and spoon some raspberry sauce over the top (you will have leftover sauce). 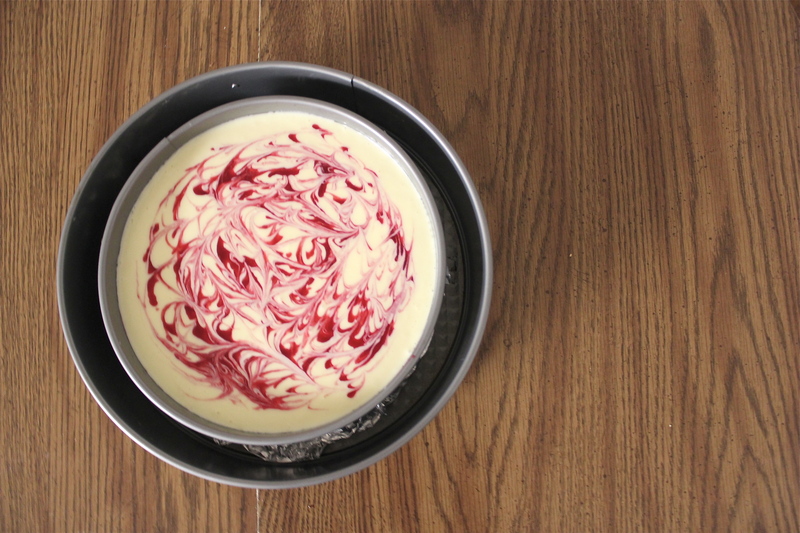 Swirl the batter with the tip of a knife to create a marbled effect. Wrap foil around the bottom of your pan, and place the pan into a larger baking pan with sids. Place into the oven, fill the outer pan with hot water. Bake for 55 to 60 minutes, checking regularly after the 45-minute mark, or until the filling is set. 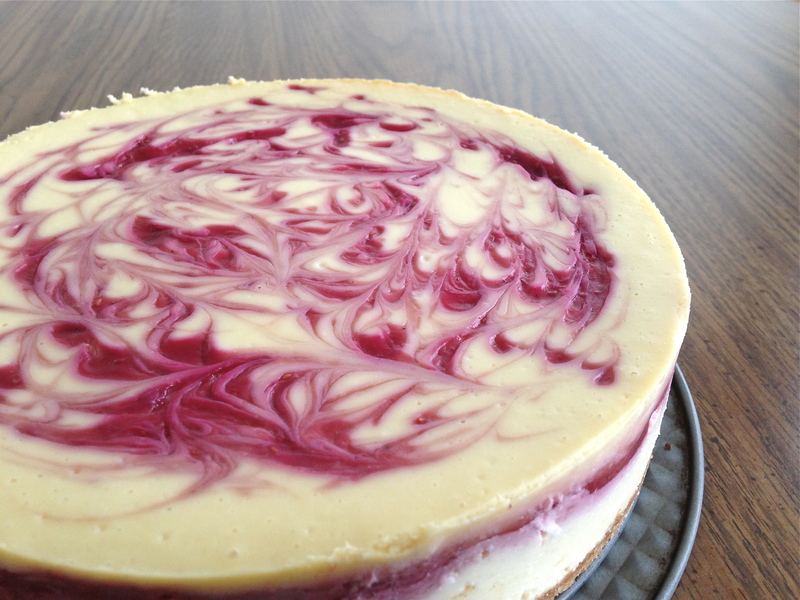 You can click here if you need help with baking cheesecakes. 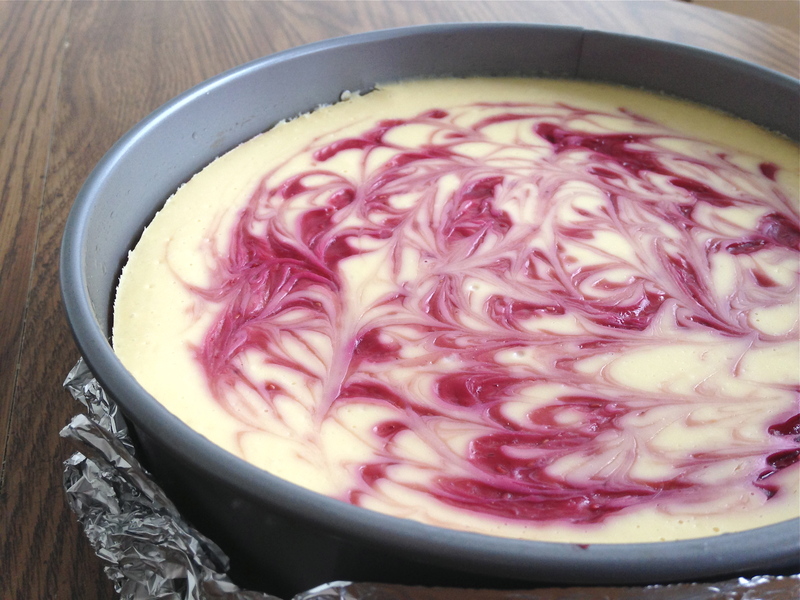 Let the cheesecake cool on the counter, then refrigerate it for at least another 8 hours before serving. You can serve it with remaining raspberry sauce. Soli Deo Gloria, and Happy reading, eating, and baking! Have a blessed week!